or... wandering around the house, finding stuff that any normal person would have thrown out decades ago. Take a walk down memory lane with me! Many of these photos were taken in 2010 -- so the subjects don't look quite as nice as when they were built (:>). I found it in The Boy Electrician (below, page 371). The postcard inside is from June 1960, but maybe the card was old? My big brother thinks I was in first grade, but I can't imagine I really built it as a six year old. 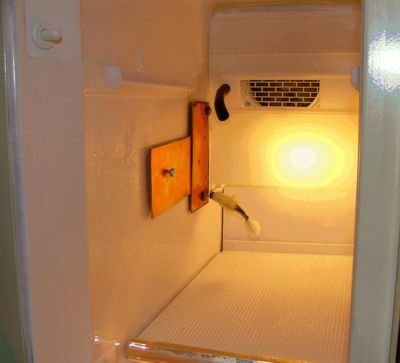 It used two 100 watt lightbulbs and it got quite hot, even with the airholes at the top. 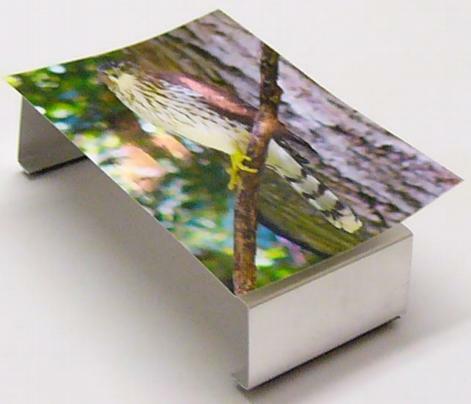 Commercial opaque projectors use a reflecting mirror to re-invert the image, so postcards (which it was designed for) had to be placed upside down, and writing of course came out backwards. 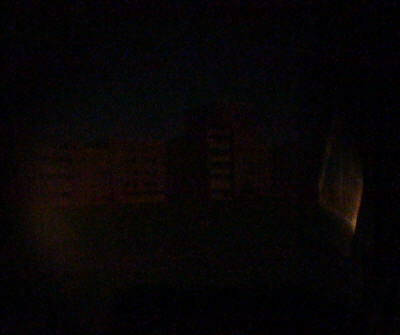 The projected image at the right is barely visible because my digital camera won't let me expose it long enough. Not worth pulling out my old 35 mm SLR and develop real film! An Idiot Box from some time in the 1960's: all it does is flash neon lamps. It's just three sets of relaxation oscillators made up purely of neon lamps, resistors, and capacitors. Originally it used high voltage "B" batteries, but later I changed it to run off of the 120 VAC powerline. Most of the parts have since disappeared, but it had an RF filter cap and a germanium diode (plus headphones). I'm not so old that I had to actually use a galena crystal with a cat's whisker! I ran about a 50 foot wire from a second story window out to the backyard, and could pick up quite a few Baltimore AM stations. 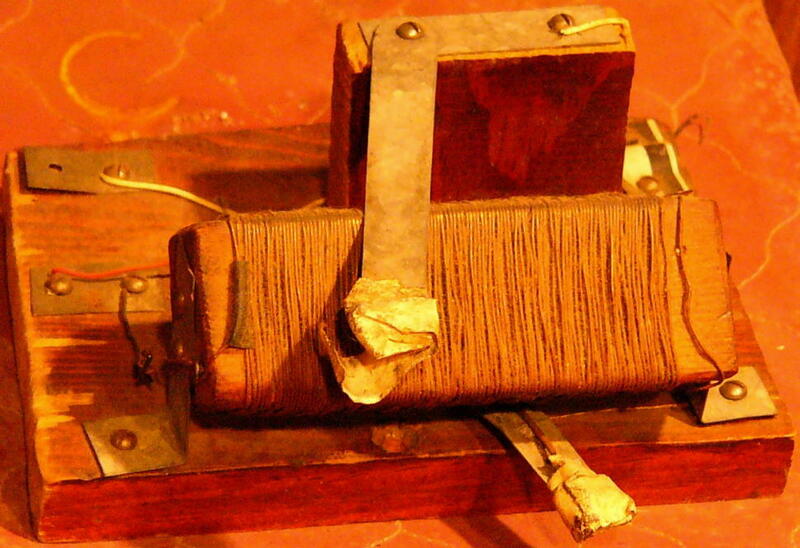 Other early projects: I built lots of stuff from Alfred P. Morgan's The Boy Electrician which I found in the library. A pdf of the book is here. I definitely built the microphone which is shown on page 175, but it wasn't quite like he shows it: I cut open two D batteries and removed the center carbon post (did a lot of that). Mounted them horizontally on the top of a cigar box, and laid a length of mechanical pencil graphite across the two posts. Then just put a battery and headphones in series with the contraption. I remember showing it in fifth grade, so that would be 1965. 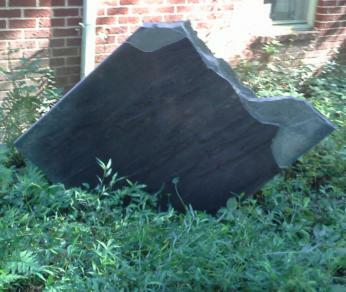 I built the transformer shown in page 226. It seems crazy, because in the 1960's you wouldn't necessarily find the kinds of stores Morgan wrote about originally in 1913! But I found a sheet metal shop within walking distance, and the guy cut up hundreds of rectangular pieces for me. Couldn't have cost much as I was a little kid. Somehow found the copper wire, too. After building that one transformer, I decided I'd just get ready-made ones in the future. Built many electromagnets (remember the large cylindrical 1.5 volt batteries with thumbscrew connecting lugs? ), and some 2-pole DC motors (constructing the commutators so they wouldn't come apart when spinning was a challenge). Maybe they were from page 306? 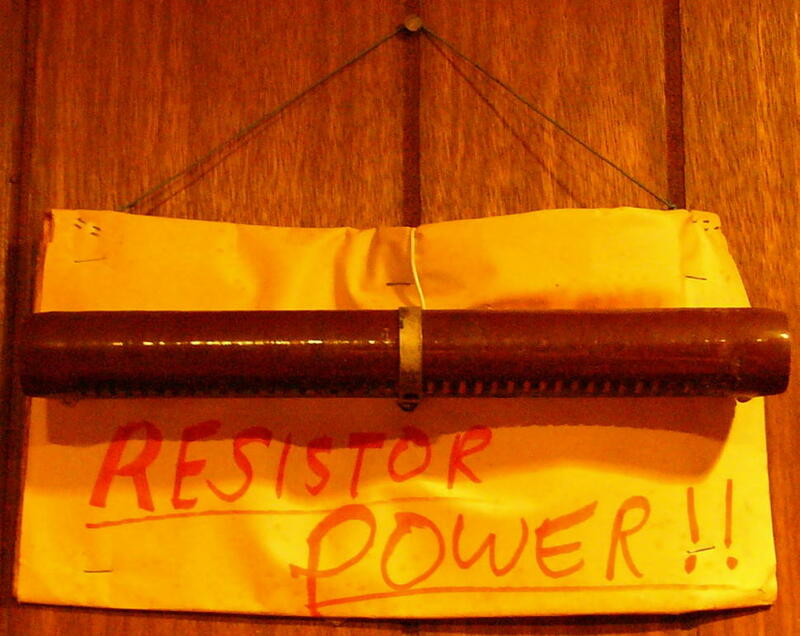 I did make a "bullhorn" which was a transistor amplifier wired to a speaker. I was definitely not impressed with the loudness, it was probably 100-200 milliwatts. I had an intercom system on several floors of the house, probably when 11-12 years old. Speaking of transistors, I struggled to understand them. All the books said you put current in the base-emitter junctions, and you got amplification at the base-collector pins. I don't know how many transistors (they were all germanium in those days) I blew out in the 1960's, because I put a battery directly between the base and emitter (properly forward biasing it) and a DC motor at the base-collector; I expected the motor to turn faster than without the transistor. Never happened. Eventually I learned the difference between power generation and control modulation! This doesn't really belong in this section, but it's chemistry. In Drew Wolfe WA3KLK's high school chemistry class, we fermented various fruits and distilled the mash into wine. But I double-distilled (maybe triple?) mine! The result was probably near 100% ethyl alcohol. "Teach" advised us not to sample our wares, we were aware of potential serious health issues. But we were high school kids! Are you kidding me? I did take one sample (back then) and found it to be quite potent. I was already wearing eyeglasses and didn't become any more blind. This is the actual booze. Yes, yes, I know -- you don't have to tell me. The fact that I still have this proves that I'm certifiably crazy! Originally I had an old large pressure tank, and lots of salt and neutralizer equipment for my well, all from the original construction in 1966. In 1992 I removed the neutralizer and salt equipment, and installed the neutralizer (tan, above left). 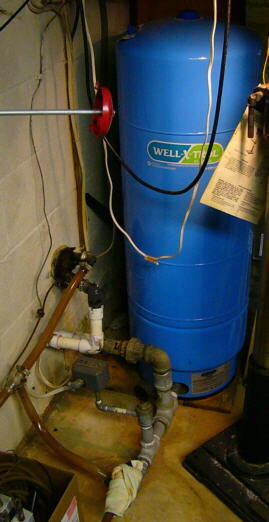 Also added the whole-house water filter (blue device to the right of the neutralizer). I still have a heck of a time getting compression fittings to completely seal, always afraid if I tighten any more it's going to strip the threads. I figure if the socks let the very very slow leakage evaporate before it drips, that's good enough for me. I had repeatedly patched pinhole leaks in the pressure tank until it seemed to be more patches than intact metal, and was afraid it would simply disintegrate one day. 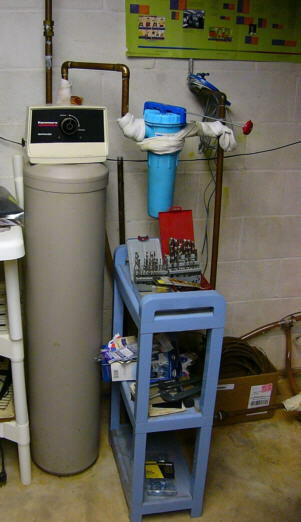 So in 1996 I removed the original pressure tank and replaced it with the physically smaller (but equivalent) Well-X-Trol tank with an internal bladder (blue, in center). The original tank was to the left, can still see the circle on the floor underneath the sock in the center picture. Came up with a mixture of galvanized pipe fittings to connect the new one. The copper pipes from the inlet to the neutralizer periodically develop pinhole leaks; I put rubber gasket material and hose clamps on as a temporary fix until I can't stand no mo' -- and then depressurize and replace offending pipe section. The sock in center picture removed after such replacement in August 2010 when pic taken. 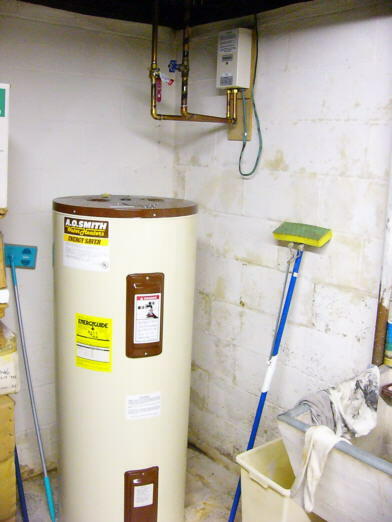 In 1993 my electric water heater started leaking and replaced it with a standard 55 gallon unit (A.O. 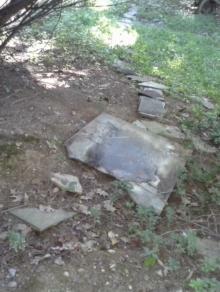 Smith tank in right picture). All of the major work above done with K3VC's help (a real plumber). 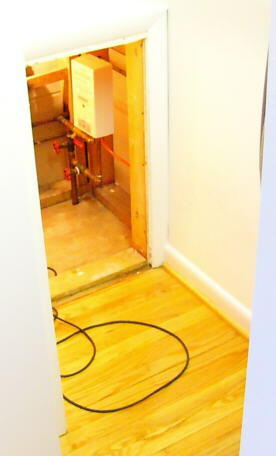 I had a bad pipe leak and it ended up filling the basement with water before I noticed it and shut off the well pump. So, like closing the barn door after the horses had escaped, in September 2010 I installed an automatic well pump shutoff system. I bought a Basement Watchdog Water Alarm ($10 at Home Depot). It operates off of a 9 volt battery and has contacts on its bottom (which can be detached from the unit). When water on the floor is detected, it emits a high-pitched warning sound. I was very impressed: with no alert active, my DVM could measure no current drain! So it was less than 0.1 ua. It draws about 13 ma. when active. All in all, quite power conservative. I designed a simple circuit with two optocouplers to detect the current drain when active and latch an output once tripped. I wanted to be able to disable the well pump, which draws 9.6 amps @ 240 VAC, and was looking around for a relay which had hefty enough contacts in the normally-closed configuration. I found a discarded air conditioner contactor, but it only had normally-open contacts and its coil was driven with 240 VAC itself. I suppose I could have used it and powered the coil from the output of the pressure switch (which would only turn the contactor on while actively pumping), but I'd still have to drive a 240 VAC coil. Then I found a discarded BGE (electric power company) radio unit designed to receive signals to temporarily disable an electric hot water heater during high demand periods. It had exactly what I needed: a relay with normally-closed contacts with plenty of current/voltage handling capability, with a 12 VDC @ 100 ma. coil! 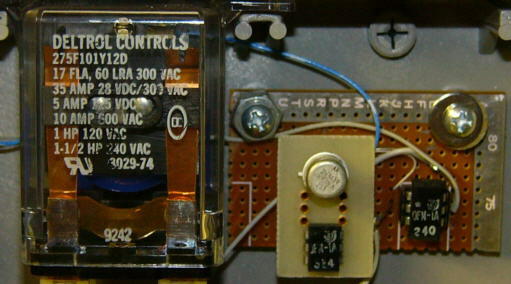 But instead of just taking out the relay, I saw that the box itself had a built-in 240 VAC in/12 VDC out power supply. Plus a convenient box to build it in! Just what the doctor ordered. I just cut the 240 VAC feed going to the pressure switch (which in turn drives the well pump motor) and fed it through the new box. The little protoboard on the right is my addition to the circuitry, it literally just contains two opto-couplers. I re-routed the relay coil to be driven by my circuit instead of the original receiver. I powered the Watchdog Water Alarm from the 12 VDC ac supply, so no need to worry about batteries going bad. Plus didn't even have to open the Water Alarm box, as the opto-coupler simply senses the power drain to the battery jack. I added an LED (at the top, illuminated in the photo) to show that the relay has latched (and the power feed is inhibited). 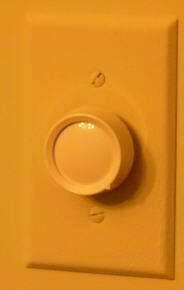 To reset the circuit, I just need to temporarily remove power -- and there's already a switch on the wall that does that. So the next time there's any type of leak in this inlet area (copper pipe pinholes most likely) at least it can't do too much damage -- plus I'll be alerted by the screech sound. Here is the drawing. I also put another Basement Watchdog by the basement door to alert me in case my outside pump gets clogged up. I used an AC adapter to power it instead of a battery. In March 2009 the main (A.O. Smith) water heater from 1993 started leaking. Instead of replacing it with another similar unit, I did away completely with a tank-based system. Installed the on-demand Eemax EX95 "Flow Controlled" Electric Tankless Water Heater instead (above left, also above the A.O. Smith tank picture). It draws 40 amps @ 240 VAC (9600 watts!) -- but only while the hot water is actually being used. This has saved on my electric bill. I know how to solder wires, but have never been too good at soldering copper pipe. Managed to cut out the original piping and put in the U-bends to the Eemax heater with no leaks, pleasant surprise. That solved half the problem. 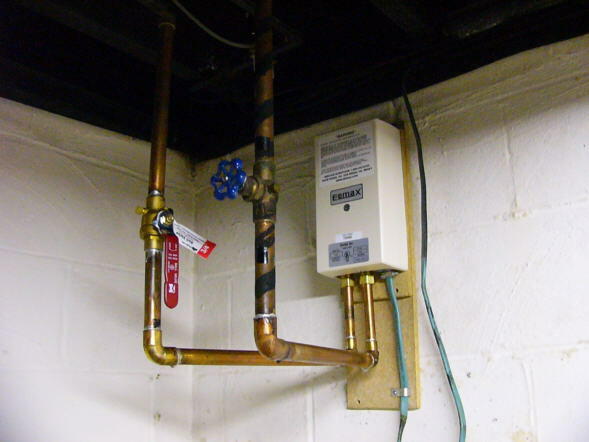 There is a long pipe run from the main water heater to the upstairs bathrooms, and it always took a good two minutes to get hot water there. Originally there was a small electric tank heater in an alcove behind a bedroom closet (above right) which was fed from the main heater. Only a few feet from the bathrooms, this gave a fast heat response. Too bad that heater had been broken for many years. I would have replaced it eons ago, but all of the fittings were corroded, and access to the tiny spot through the closet made me fearful that I'd make matters worse if I tried to remove it. But the EX95 in the basement doesn't have enough oomph by itself to satisfactorily power a bathtub fill or shower. 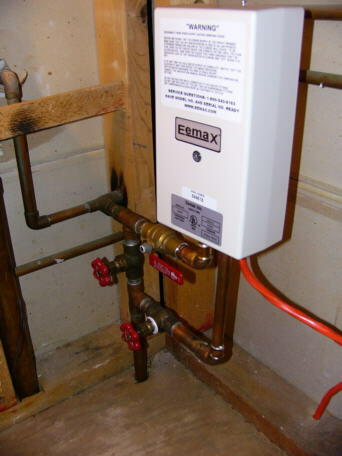 I took the opportunity to finally address the small water heater failure by replacing it with an Eemax EX65T tankless unit. This device is microprocessor controlled (PWM) to maintain a constant output temperature. (The EX95 isn't, it heats the water as much as it can as it flows.) Necessary, because it is fed from the EX95 and the two together could possibly boil water. It draws 27 amps @240 VAC (another 6500 watts!). I put a low-flow aerator on a bathroom sink which manages to provide just enough flow to activate the EX65T, but is below the activation threshold of the EX95. 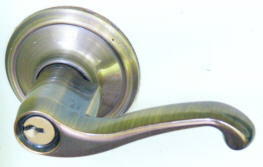 Which accomplishes two things: (1) it saves power, because the main unit is not turned on (which would be useless anyway because you finish handwashing before the hot water makes it upstairs to the sink); and (2) it keeps the flow rate low enough so that the EX65T by itself can heat the water sufficiently. It's still necessary to wait a couple of minutes for both heaters to contribute to showers or tub fills to handle those rates. In all, this combination has proved satisfactory, though not really quite as good as a tank heater. To be fair, the EX units are not rated for whole-house usage, but the stronger unit takes three 240 VAC 40 amp feeds, which would have been more aggravation at the circuit panel. As it was, I was able to re-use the 240 VAC line to the main water heater but had to run a new 240 VAC line to the EX65 (there was only 120 VAC in that location). It was a challenge to do the pipe work in the alcove (above), especially as it's impossible to see all around the pipes that need soldering. The hardest part was loosening the nonfunctioning existing valves in order to replace the washers. Successful on one (you can see the plumber's tape on the lower one), I replaced the upper with a ball control type, and gave up on the bypass valve in the back which seems to be stuck closed which is what I need anyway. I'd much rather work with electronics! Reliability. 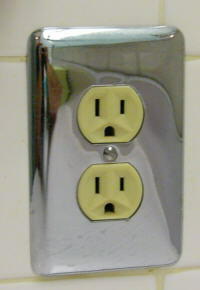 The heating element in the main water heater opened in September 2010, 18 months after installation. The warranty is for one year. Concerned that this might be a recurring problem, I phoned tech support. Apparently they had made some unspecified changes in the design, and they sent me a free replacement element. Actually quite easy to repair the element anyway: the resistance wire (like a toaster's coiled spring) broke at the mounting screw. Just re-wrap on the screw. So I now have a replacement ready for next time. Repaired again 10/2014, and 6/2017; EX65T 2/2019. 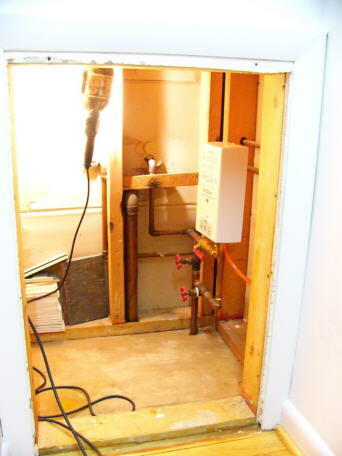 While it is easier to repair than with a traditional tank water heater which has to be drained first, it is a bit of a challenge to get the element out of the unit: twisting with a crescent wrench while pushing up with a screwdriver works. My basement doorway has a drain, but where it goes, nobody knows. It does work after a fashion, but usually quite slowly. During heavy downpours the stairwell water level rises until it sometimes goes over the lip and leaks into the basement proper. I've bailed and mopped not that often, but more times than I'd prefer! In July 2009 I bought a central air conditioning condensate pump. I cut out a hole at the bottom on the box's side and covered with a filtering screen. Attached more ballast (35mm plastic film cannister) to its internal float to get it to trip at a lower water level than normal, and adjusted the microswitch activation hookup to change the hysteresis amount. 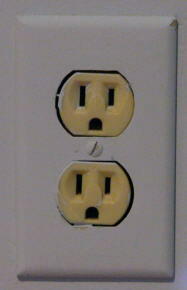 Had to install a 120 VAC outlet outside the door, too. There's a plastic hose that takes the outflow away from the stairwell. So when the water level rises (but not to the lip's height) the pump activates and pumps the water away until it leaves a small residue. It works fine, but the biggest problem is that I have to clean it every once in a while or it gets clogged up with dirt prevalent in the woods. 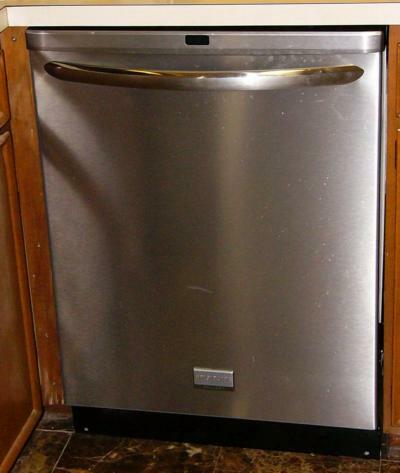 I had repaired my original 1967 model Tappen dishwasher over the years, but it was time for it to go. So in November 2010 I bought a new one. My biggest concern was that the kitchen floor was now a little higher than before because in 2008 I had had marble tile installed. I wasn't sure if I had the clearance to get the new one to slide into the space below the countertop before it would drop down off the edge of the marble. Inspecting the manufacturer spec sheets shed little light as they were incomplete. I just decided to go with hope and figured as a worst case I might have to remove a number of tiles to get it in and reglue them afterwards. Turned out there was sufficient clearance even with the new tiles. 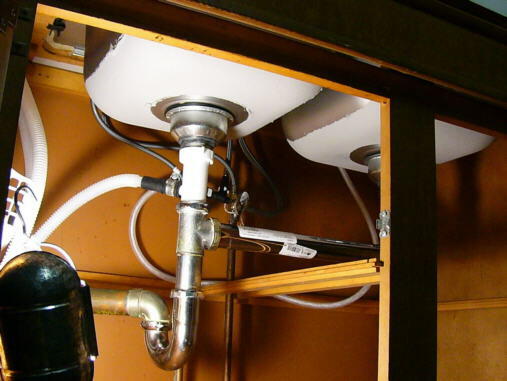 The biggest part of the job was rearranging the plumbing feeding the unit, as the connecting point was in the rear instead of in the front. Had to do soldering in the far back of the wall where I couldn't see behind the pipe. But it worked out! 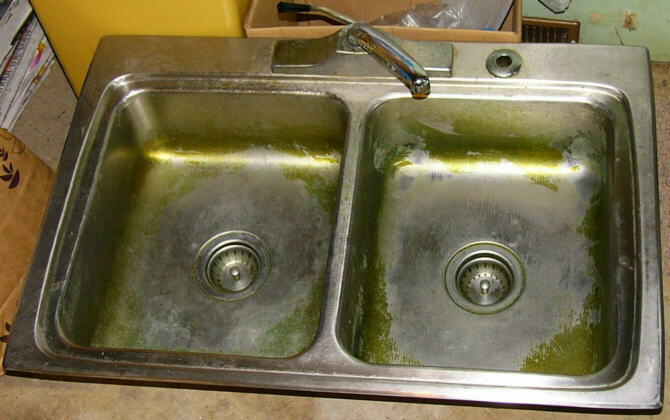 My kitchen sink (above) was the original install from 1967. I scrubbed it, but it still didn't look that great. 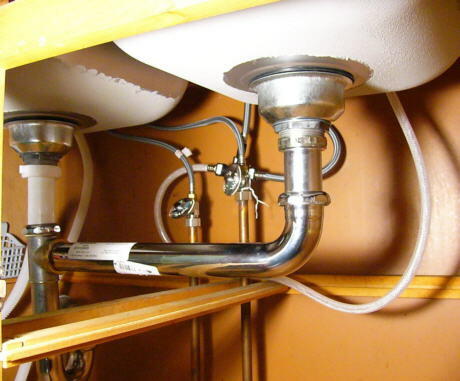 The faucet was corroding and beginning to leak. So in November 2013 I figured that I might as well replace the sink along with the faucet. The plumbing didn't have shutoff valves at that point, either. So I shut off the main supply, sawed off the hot/cold pipe feeds, and unbolted and pried the whole sink assembly out of the countertop. The new faucet uses a flex hose coupling, so all I had to do to update the plumbing arrangement was to unsolder the size reducer and attach new shutoff valves with a wrench. Much easier than replacing the dishwasher plumbing -- when I had to solder a new pipe configuration underneath the counter somewhat blindly. The original sink had a 6 inch depth and it was hard to tell how much clearance I had for the existing plumbing underneath because in addition to procuring the sink itself the drains have to be bought separately and mounted in the drain holes -- with differing heights. So I bought a new sink with a 7 inch depth. When I dropped it into the spot (after I had to enlarge the opening in the countertop a fraction of an inch with a saber saw) I saw I had an extra inch. 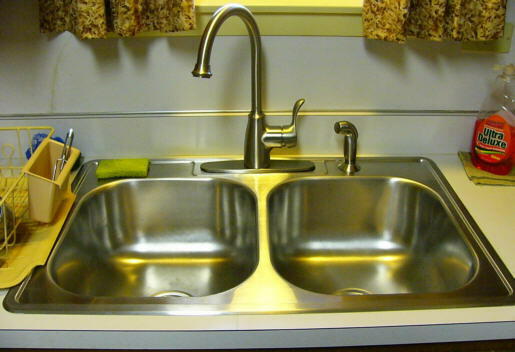 So I returned that sink (it also had a minor ding on it that was undesirable) and bought an 8 inch depth version. The vertical height was then very close to the original, but amazingly the horizontal space between the two drain pipes was longer than the original! For the same size sink??? So I had to discard that drainpipe connector and put in a new one. I like the faucet and the sink looks great. 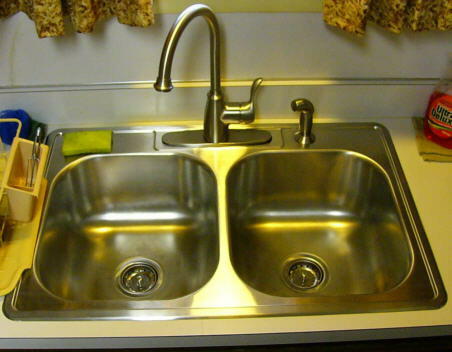 But even though the actual double sink dimensions are identical to the original, this new one has more rounded corners. So pots that could lie flat before now do not. Oh, well! 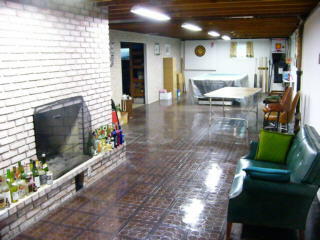 In 1983 I put self-stick vinyl tile down on the unfinished basement clubroom cement floor. 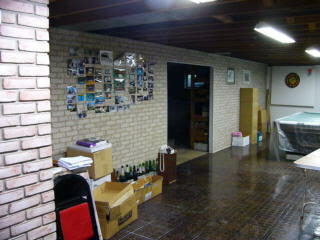 Then I put up faux brick wall paneling in the clubroom to match the actual fireplace brick. 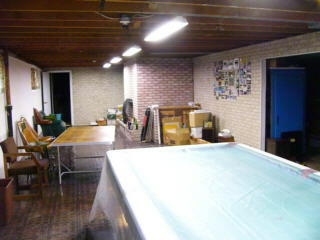 Thankfully, the studs separating the clubroom area from the rest of the basement were already there. Installed a bunch of fluorescent light fixtures on the ceiling. It felt funny sitting higher than I'd become accustomed to with the broken springs! Very pleased with the result. But it was a bigger job than I had anticipated. 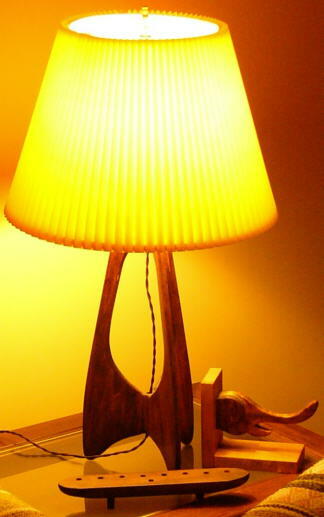 The lamp stand was a standard project(? ), but I made the elephant and menorah for fun. Might have been ninth grade. 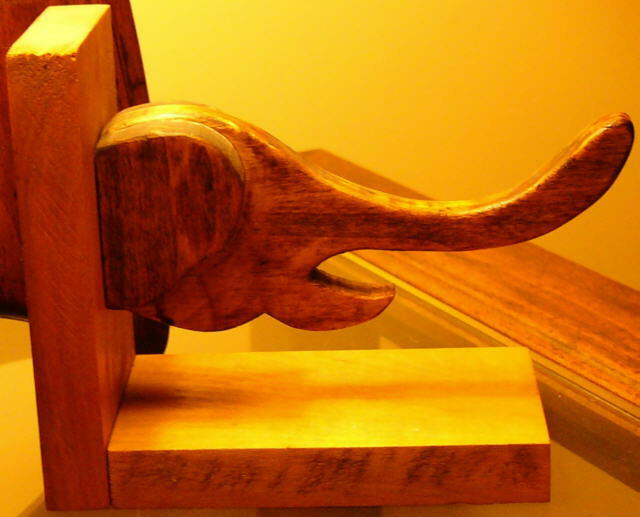 Also made a necktie rack and a segmented dog in the seventh grade which I can't seem to find. I know this doesn't belong here because they're not wood -- but I made these in ninth grade metal shop. 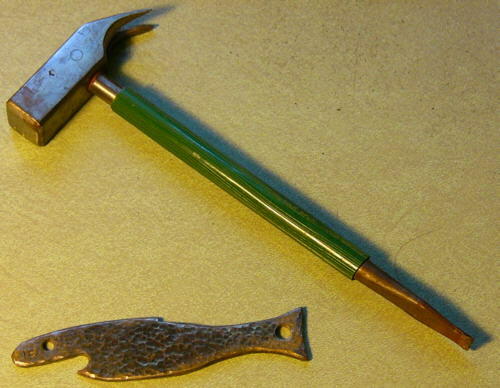 That's a combination hammer/screwdriver and a bottlecap opener. I built this ham shack bench in 1969 and still use it. Very easy, since I covered it with contact paper instead of properly finishing the wood! In 1983 I used my scroll saw to carve out this wooden road sign. Painted it with fluorescent orange paint -- it was illuminated at night with a (regular) floodlight. Even though I had layered it with protective spray lacquer, it needed regular repairs due to wood deterioration from its location in the damp woods. 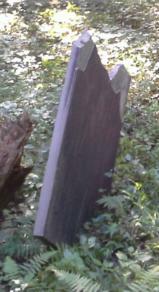 Eventually it decomposed so much that I replaced it with a metal version. 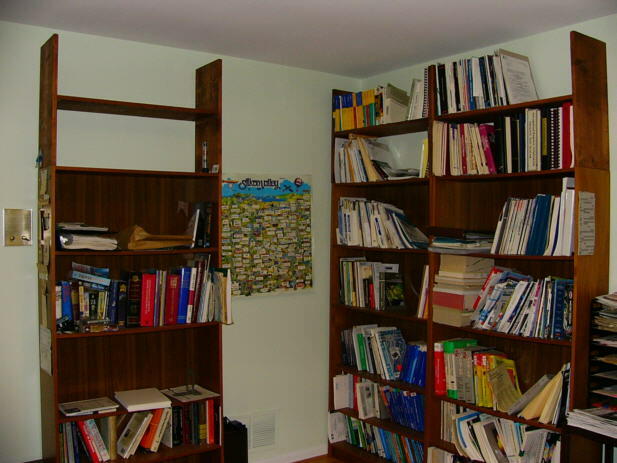 I had more books than would fit on my three purchased bookshelves, and the ceiling left more room... so I built three "additions" for their tops to give me seven shelves each. At least I bothered to stain and lacquer them! (In the 1985-1995 timeframe.) I had them all stuffed overfull; after the onerous task of boxing everything up to empty the room for remodeling (2008), I never fully unpacked and replaced all of the books... yet. 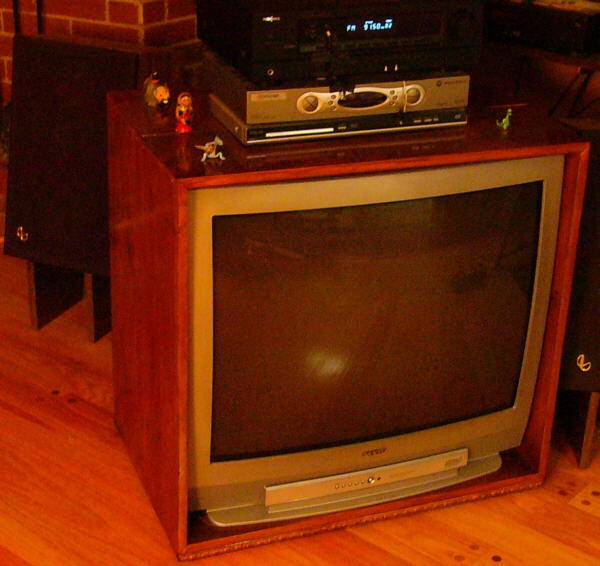 I bought the TV in March 2004 and constructed a custom console for it. It needed to swivel, so I put six wheels underneath (hidden by the moulding strip) in a fixed circle orientation. 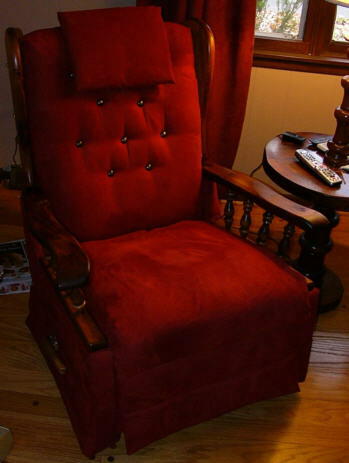 There's also a center bolt-mounted pedestal slightly higher than the wheels to facilitate the rotation. After cutting, assembling, and staining I believe I used up the entire can of Minwax! In August 2014 the CRT HDTV was 10 years old and I figured it was time to invest in a flat panel for its replacement. I had procrastinated mostly because I didn't want to deal with re-doing the wood console. 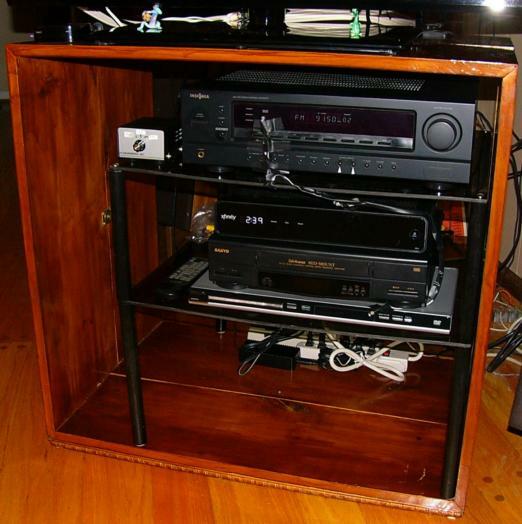 So I built a two-shelf interior (a Telcro II cabinet smoked plexiglas front cut in two with wooden dowels as legs) to hold the stereo and video equipment, and placed the TV on top. 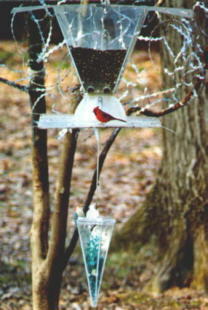 The inverted pyramid container directs all of the seed to the bottom feed holes; is large enough to hold 25 pounds of birdseed (which lasts 4-8 weeks); and provides nothing to grasp. The tray is plexiglas, much stronger than the ceiling panel. 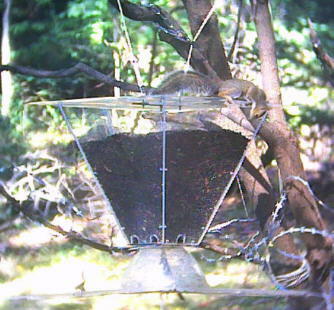 I added clear moulding edges (with spring releases to flip down when squirrels jump to it) to trap fallen seed. The pulley/weight system is retained, but the separator (salad bowl) is attached to the top section and not the tray itself -- when the tray drops down, there's nothing to grab. 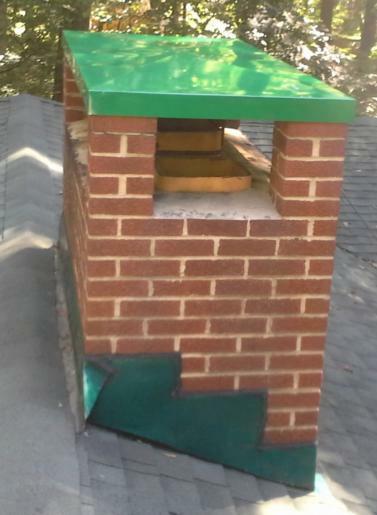 Originally (above left) the roof was the same size as the bottom tray, but I modified it to provide an overhang on all sides to make it impossible to drop down onto the tray (two right photos). 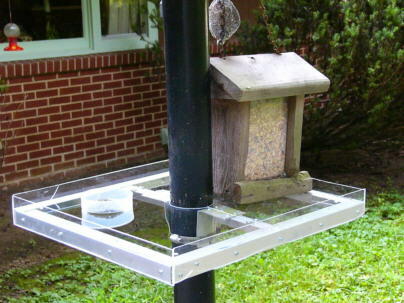 Initially the weight was a plastic container filled with counterbalancing rocks, but it was unsightly. The final configuration is at the right, filled with aquarium rocks and fake seaweed. 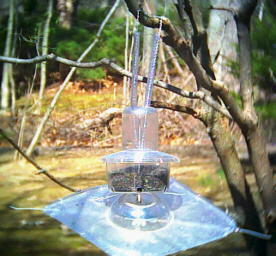 I also suspended it with a double rope through pulleys on the tree branch, so I can hoist it up and down for refilling. 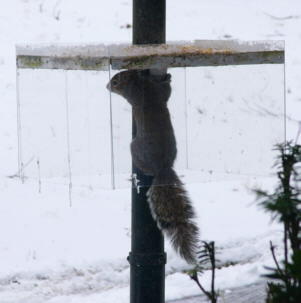 The squirrels occasionally jump onto the tray, but they immediately fall off. Success! 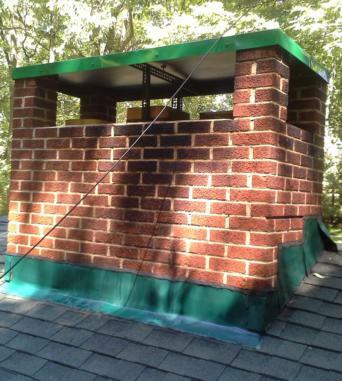 It has remained unchanged since the beginning of 2003, except I redid the roof with quarter-inch thickness material -- as it had to be strong enough to withstand the weight of a foot or more of snow. 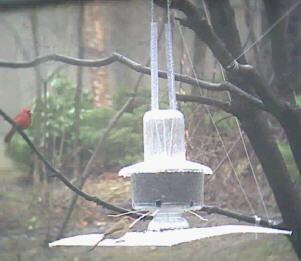 That was kind of ugly, so after my plexiglas experience with the main feeder, in 2004 I constructed a new post feeder that surrounded the post (center shot). 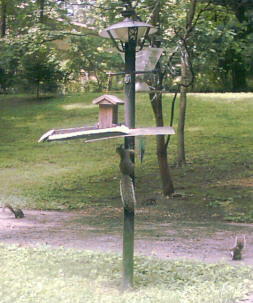 The squirrels couldn't simply climb over it, but still some enterprising ones managed to catapult themselves off the post and around to grab onto the short side. I added some flat horizontal extensions on those sides with limited success. Then I came to the final solution: the long vertical extensions (right). 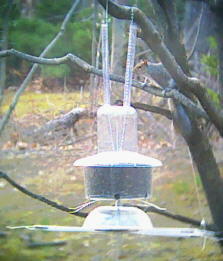 Now no more squirrels on the post feeder -- except when we get a few feet of snow, which puts the shelf within jumping distance from the new ground level. I built the timeout box at left circa 1970. I think this is the schematic. You power a radio from it, set the on period, and go to sleep. It'll shut down as desired. Nowadays all clockradios do this. 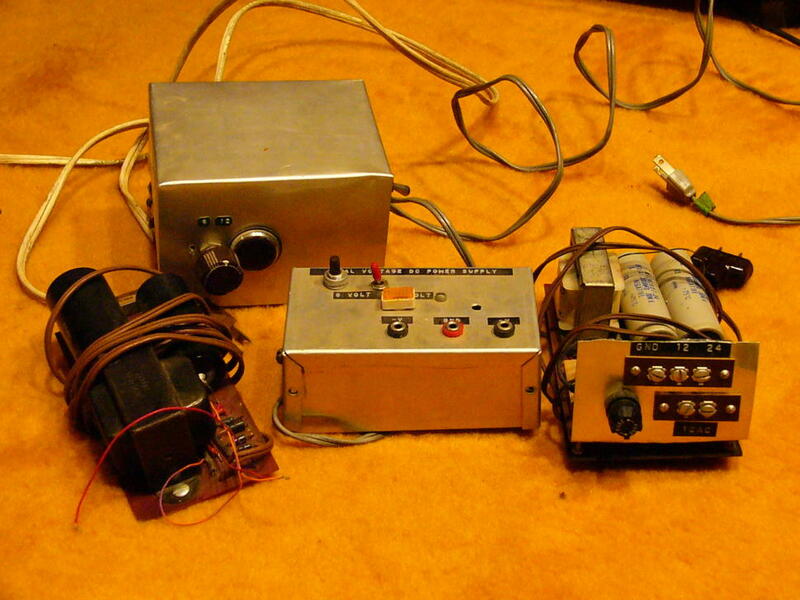 The Transistor/Diode Analyzer at right is from the 1970's. Connect an oscilloscope to it and it generates voltage/current curves. I bought lots of (unknown) "surplus" semiconductors from sources such as Poly Paks for pennies and measured the parameters to see what I had. Our high school formed an It's Academic team for the local television show. Someone decided that they needed a pushbutton/lightbulb system as used on the show for practice, so I designed and built one in 1971. It drove three regular 120VAC light bulbs (the first person to hit their answer button latched their lamp on and locked the other two out until the advisor pushed the reset button). All high voltage circuitry which used triacs. It worked except for one problem: There was more than one specification for the maximum voltage the triacs could withstand. I don't remember exactly what they were and I think the current devices available don't have this particular distinction any longer. But apparently I violated one of the specs. The result was that sometimes the "off" triacs would activate as if a ghost had triggered them. The circuitry wasn't harmed, but more than one light would illuminate -- obviously not giving the correct winner. The science department (really Drew Wolfe WA3KLK) had variacs (not sure why) lying around. So the "fix" was to lower the line voltage a little bit from the nominal 120 -- which then met the triac's operational window -- and it operated perfectly then. I would have replaced them with higher voltage rated parts, but I think they were fairly expensive semiconductors back then, and even though I was working with the It's Academic budget allocation, we just used a variac and left it at that. 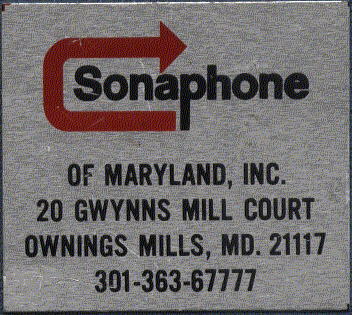 In 1973 my aunt rescued me from sweeping floors at Woolworth's and got me a job at Sonaphone (she was their bookkeeper). While this was five years after the famous 1968 Carterphone decision, still most people had phone systems leased from the Phone Company. 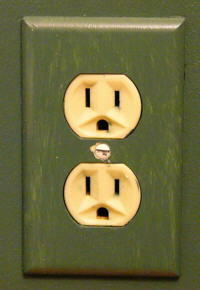 Competing equipment was not permitted to connect electrically to the phone wiring. The government was requiring the Phone Company to permit interconnection, but the weapon wielded against that was the claim that non-Bell gear might "damage" the telephone network. The FCC had not yet created the Part 68 regulations which set standards and a policy that permitted direct connection to their sacred network. 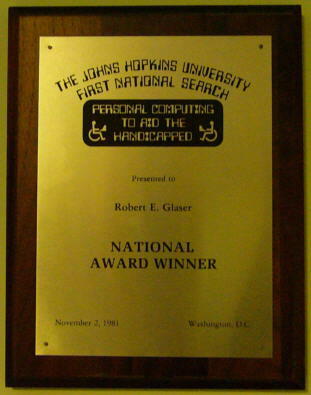 In order to install competing telephone systems, the user had to lease (monthly rent) special interfaces from the Phone Company that ostensibly re-created the exact same electrical specifications as the network itself, but "protected" the network from damage from the supposedly poorly-designed competition. What a gimmick! First, it really was just a guise to (1) inhibit customers from defecting from Ma Bell because they couldn't escape the additional interface charges; (2) in reality the equipment in no way could damage the network, it was pretty hardy being a relay-based system; and (3) it was like putting linebackers in between the interconnect company and the customer -- having to run circles for attachment. These interfaces were a travesty -- I vaguely recall three generations of them, but can only think of the name of the most recent and advanced: C2ACP. 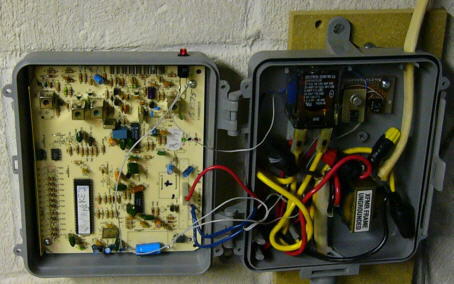 It was a big box that hung on the wall with multiple relays and audio coupling transformers. What was funny about this time period was that while it was totally legal and proper to sell and install competitive telephone equipment (so long as it went through their precious interface), people mostly didn't realize that as they had only known Phone Company standard equipment their entire lives. So when our salesmen went to businesses (to mostly install key telephone systems, occasionally a PBX), we were greeted with a snicker, as if they thought that together we were somehow doing something illegal -- which they were happy to jump onboard with, by the way (anything to get back at the Phone Company). The price of purchasing our telephone equipment plus leasing the interface was still less than the standard fare. We were buying key systems from T.I.E. in Connecticut -- the KSU's (main phone box) had to be put together with wirewrap dependent upon the installation's requirements, but the circuit boards were ready-to-go. Initially my job was to build and then design simple modifications to the standard T.I.E. gear. 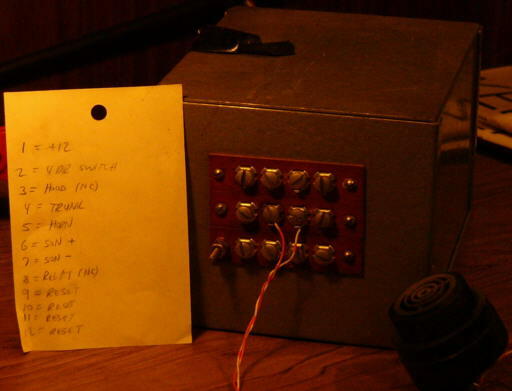 This included an interface to permit callers on hold to hear a radio station or a tape deck instead of the built-in mechanical chime; ring a bell (a really loud bell, enough to wake up the dead) for warehouse operation when the phone rang; conference units, etc. 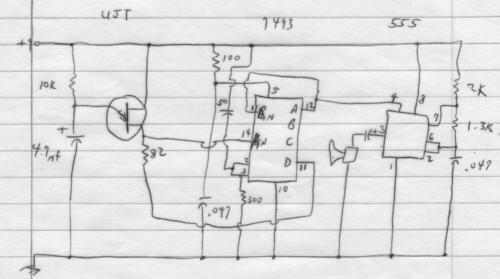 Later I tried my hand at designing speakerphone circuitry, with a modicum of success, but not really good enough for commercial usage. Here are my various schematics. The brothers who owned the company seemed to have some trouble differentiating real business matters from -- well, anything else. There was the company-owned (or leased) Maserati, the company Cadillac used by their mother in NYC... There was a spell when they dabbled in radio controlled airplanes and helicopters. As the lowly-paid company technician, they had me construct these R/C models. Which I was quite happy to do, getting paid for something I'd have done on my own if I could have afforded the kits myself. They were the bosses! The only downside was that after meticulously building these replicas, I of course had to turn over the controls to them. I probably got to fly them a little before they inevitably crashed them. As a second-year EE student, I was very happy to be designing circuits with operational amplifiers (which I had just learned about from Prof. Westgate's class) and I probably wasted unnecessary time with all that. But they didn't care (as if they even knew), because they were paying me so little (but still a few pennies more than I had been getting sweeping floors!). I had digested in detail every single T.I.E. 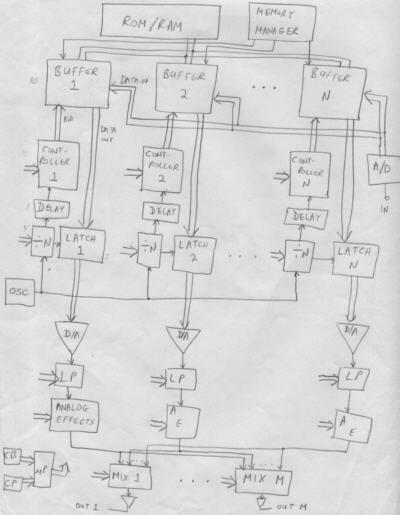 schematic until I understood precisely how the phone systems worked. Which really wasn't required to build, install, or maintain them. The owners (two brothers from New York) supposedly acknowledged my capability by making me "vice-president" -- which of course was a joke -- but they gave me a nameplate saying so! I wasn't placated; one day at our morning coffeetime, when the entire staff was still in the building, I went to see the boss. I told him that I didn't really think it was reasonable that I was getting such a low hourly rate because I was not merely building stuff that others had come up with -- I was the staff engineer. He tried to deflect me, saying what do I want, I'm already a VP! I told him he could call me the janitor if he wished, just pay me more. The bossman thought he'd pull a sly one, and told me that he'd pay me the same rate as the others (more than double my current rate) when the head technical man said that I knew as much as the rest of the staff. It was a small office, and right outside his door was the man in question: Richard Puglia. To his everlasting credit, Richard overheard our conversation and immediately volunteered on his own: "Are you kidding? We go to Robert to tell us how to do such-and-such!" (Quite a compliment for this then teenager from a man who clearly was the most experienced of our group.) You'd think that was slam-dunk, but the boss wriggled out of his promise by saying that I'd be paid what they were getting for the hours that I did the same work as them -- installations and maintenance. Which I rarely did then. I lobbied to get in on whatever installations I could. I remember one particularly humorous maintenance call: #2 brother had gone to one of our customers and tried to get him to pay his bill. He wasn't having much luck, so he went over to the KSU and started randomly pulling out circuit boards. Of course, the phones started going dead all around the office. Needless to say, the tactic worked and the customer immediately wrote out a check and begged to get his phone system back up. The #2 brother might have been a good salesman, but he had no technical knowledge whatsoever. And he began plugging cards back in without considering that in fact they are supposed to go into particular slots. So he burned out the whole thing. That was a service call I took, quite happy to simultaneously be correcting a boss' ineptitude while getting the higher salary! Later on, as the company failed (the brothers treated it more as a personal playground rather than a serious business) and the workers gradually departed (which tends to happen when paychecks bounce), I ended up doing all of the company's maintenance -- and they did in fact pay me the higher rate all of the time. As the very last employee (I myself had to resort to some trickery to get my final pay from brother #2), I carried a beeper with me to class (in silent mode) and checked in on service calls in between lectures. This was before beepers became commonplace devices for drug dealers and tethered children (long predating cellphones). When that experience was over, I vowed never again. And I never did. In a strange Twilight Zone type of quirk, years later when I ended up at Telesaver, they moved into the exact same office space that Sonaphone had a dozen years earlier inhabited: 20 Gwynns Mill Ct. There was no connection whatsoever between the two businesses (other than me, and I had nothing at all to do with location selection). I had a bunch of the leftover Sonaphone stick-on aluminum labels which I made various uses of, including small heatsinks. I thought it was funny that there were two misprintings on them: the city name, plus we were the only U.S. company with an 11-digit phone number! The first was TTL (probably in 1974, the schematic is undated) -- it drew more quiescent power than one would like for a continuous drain on the car battery, and was somewhat susceptible to transients causing false alarms. 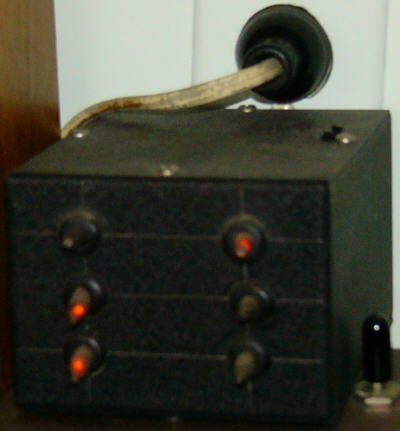 The second version was CMOS (February 1975), which solved those problems. They both functioned identically. 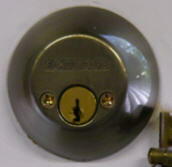 The alarm monitored the dome lamp; once a door (or hood or trunk switch) was activated, the user had to close and re-open the door within five seconds to disable it. There was an under-dash enable/disable toggle switch. My system required no special keys and it wasn't necessary to go to one particular spot on the car to disarm, as was customary at the time. When the alarm tripped, it honked the horn (on/off), enabled a Sonalert beeper (in case the thief unplugged the horn), and disabled the starter circuit (in case the robber wasn't worried about drawing attention). I knew better than to interrupt the ignition circuit (:>). After a false alarm burned out my car horn, I added a two minute timeout on the horn activation. One 9V battery was in case the thief cut the battery lead, it would still activate the Sonalert; the second 9V battery boosted the voltage to the Sonalert to make it louder. The alarm was on my 1972 Chevy Nova and then my 1981 Toyota Tercel. I retired it when I bought a 1995 Infiniti, which has a built-in alarm. In service 20 years, not bad! This circuit was in September 1975 Popular Electronics. 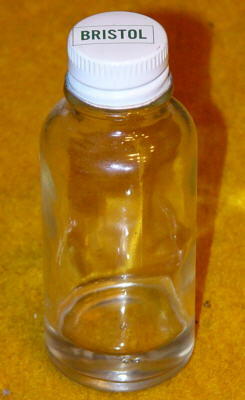 The only tricky part was making it small enough to fit into a toothbrush tube. 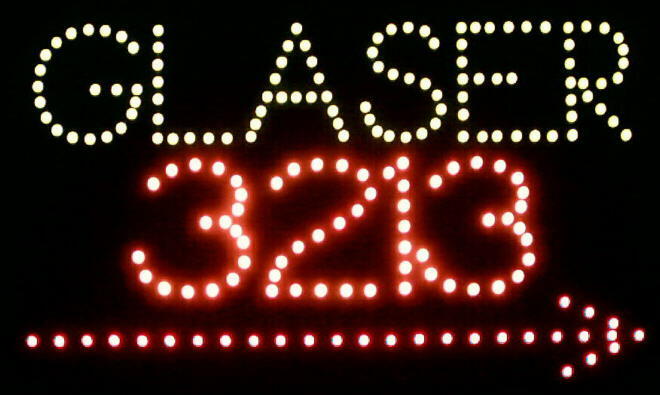 The 7-segment display shows H (high), L (low), P (pulse), or O (open circuit). This is no big deal now, they all do that. But back in the 1970's most probes just showed High or Low. Had to etch a small circuit board from the magazine artwork. Here's the article. 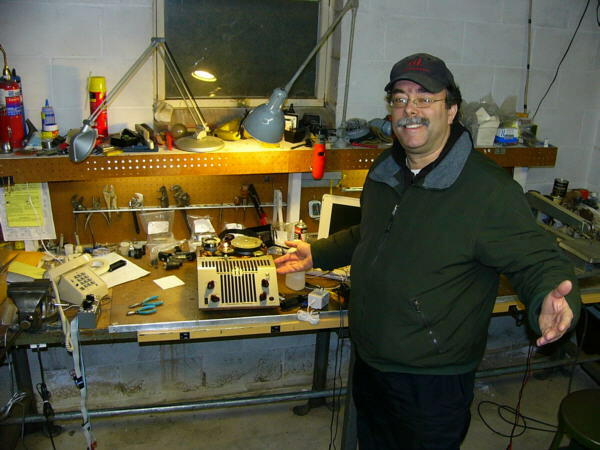 At the JHU Amateur Radio Club, those rigs cost a lot of money. So we earned extra cash at the annual Spring Fair. All of those fairs run together in my memory, but these pics are probably from the 1974-1976 time period. 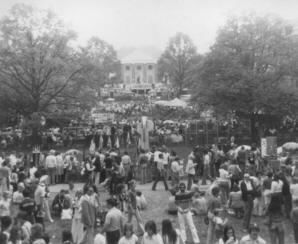 We had a prime spot at the top of the stairs between the Gilman and lower quads (center pic looking south towards Shriver Hall). Steve Fick WA3EVY (now N3TE) came up with his "Beat the Reaper" game of skill. We built this very complicated (haha) electronic challenge for fairgoers. Can't find the schematic. You had to navigate the metal loop from one post to the other without touching the bent copper tubing. One false touch and a "lose" gruff buzz latched and ended your attempt. If you make it all the way across and touch the end braid, you "win" and latch a nice pitched tone sound. Of course, we held the power on/off button in our hands -- and if you leave it off until the player reaches the end and then turn it on, it was easy to force a winner (who thought it was all skill). We needed to do that occasionally to garner more interest. Funny how it always turned out to be the cute girls who managed that feat! 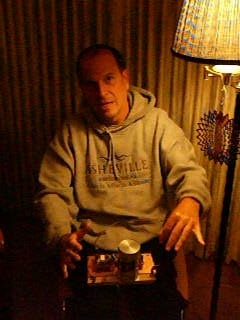 Steve writes: I remember a very raspy buzzer, with a 12" diameter 35mm film can as sounding board, which was triggered on timeout or when the wand hit the wire. 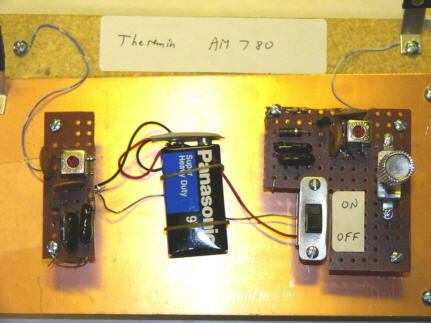 The control circuit was built around a thyratron (2D21) controller from my junk box. 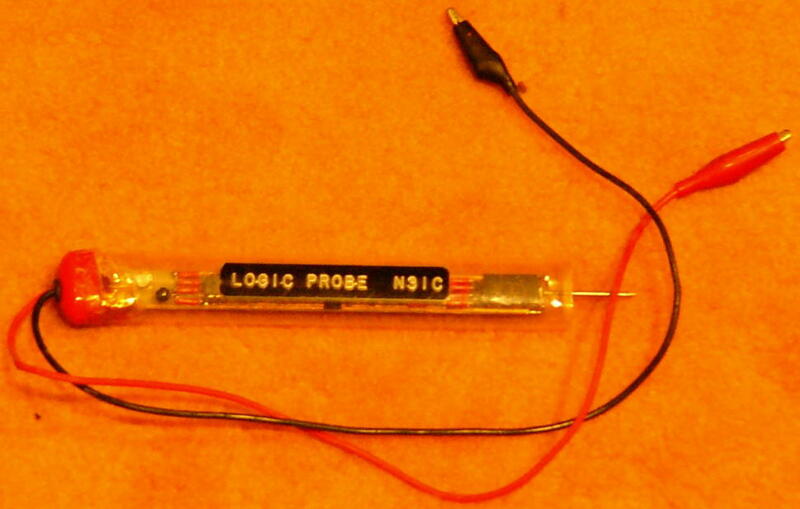 I remember a length of RG-8 shield, at the end of the wire and insulated from it, which the customer touched to trigger a success indicator. However, I don't remember what that indicator was. It might have been a Mallory Sonalert (I agree). I can't find the schematic either. 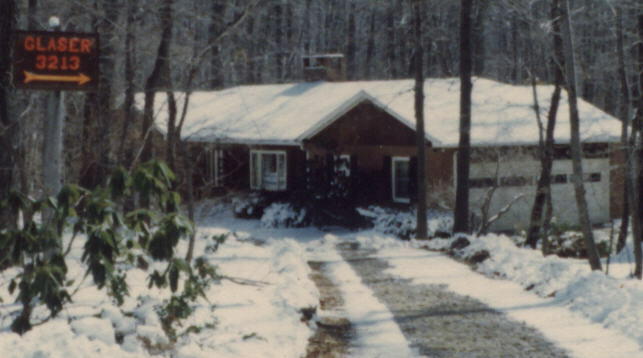 I remember visiting the shack in 1985, shortly before it was leveled to make way for the sculpture garden. The Reaper tubing and poles were still there. The club was inactive, and the place was in tatters. All the gear within about 2 feet of the floor was ruined, though, by a flood. 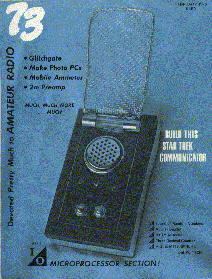 Marc Leavey WA3AJR was a real (original) Trekkie, and he wanted a Communicator. I designed a circuit for him which mimicked the sound the TV show's devices made when flipped open. At the right is the initial version of that circuit. He constructed a pretty good imitation of the icon and built in the circuit. Cool (well, back then it was! Remember, this was before cellphones.). He published an article on it in the February 1976 issue of 73 Magazine. It was made into the lead magazine article and garnered the cover (at left)! 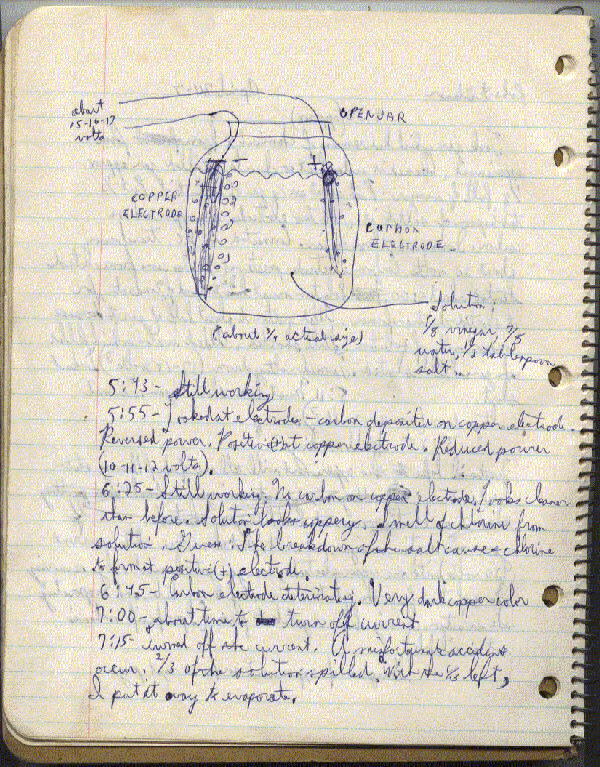 In October 1974 while an undergraduate I did a consulting job for Barry Hirschowitz to design and construct some type of medical device. I can't remember exactly what it was for, but think that it measured small skin voltages. I might have been given schematics of a commercial device based on vacuum tubes that performed a similar function. 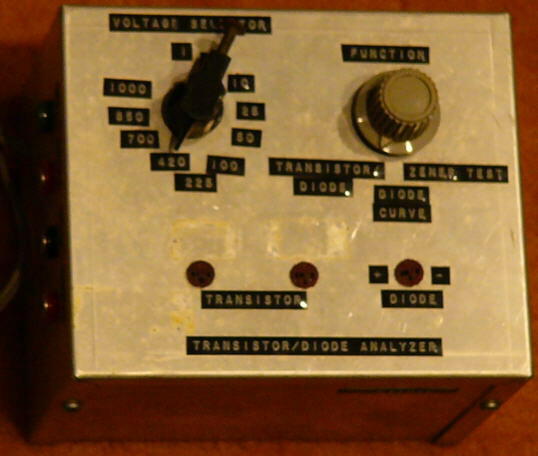 It was essentially a very high input impedance voltmeter, and drove a large analog meter (100 millivolts bidirectional full-scale). I used FET-input op-amps and had to take extra care to isolate and shield the inputs; it used differential measurement to inhibit noise and AC line pickup. It incorporated a 5 Hz low-pass filter for that same purpose. I provided high and low LED indicators tripped by settable threshold voltages, so it might have been some type of bio-feedback device. From the drawings it looks like I made up a single-sided circuit board. I don't have a photo, but here is the documentation for it. 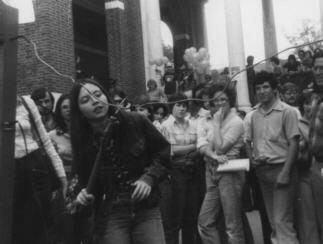 In 1975 fellow undergraduate student Eugene Mauro came to me with a proposal. Music synthesizers of the day were analog devices which created interesting but clearly artificial sounds. 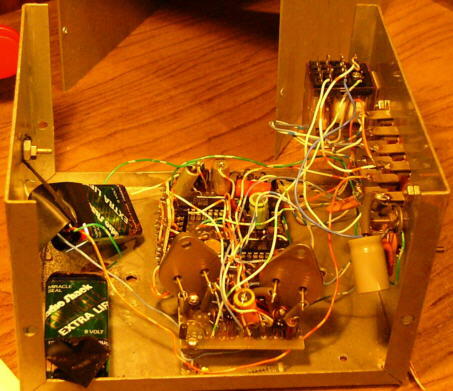 His idea was to use nascent computer technology to record and play back real musical instruments at different rates to produce a new kind of music synthesizer. He was a musician, and had taken some electrical engineering courses, but knew that he couldn't design it himself. Eugene's plan was to write up design details, build a prototype device, and obtain a patent for it. He paid me some money (I wouldn't do the work purely on speculation), and we were to share in the profits when they came rolling in. He had a patent attorney working with my writings, but the predictable happened: he ran out of money getting the legal work done. Let alone to have enough to actually build the prototype, which we estimated would cost thousands of dollars. The design was fairly large, consisting of multiple microprocessors (interesting that I selected the COSMAC processor for it) -- but I had (and still have) no doubt that we could have built it and that it would have worked. He had little choice but to abandon the project. To this day, when I pass by the dozens of inexpensive Casio synthesizers in the electronics stores -- which are simply cheaper modern-day implementations of his Replicating Digital Synthesizer -- I cannot help but think of Eugene and lament that he never got any credit, let alone millions of dollars, for this. He had a music store in Waverly for a while. I ran into him maybe ten years later there where he had happily recently obtained some professional recording studio equipment. Here are my description and design documents. I designed an interface system for Maryland Electrical Testing (MET) which was delivered in September 1977. 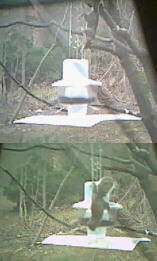 They were conducting an extensive powerline measurement study, I believe for the Army in Virginia. They had purchased many magnetic tape recorder units produced specifically to log AC voltage, current, and phase for that purpose: these recorders moved very slowly -- I think each tape cartridge lasted around a month. 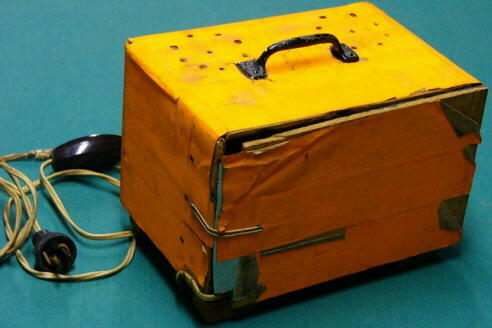 The recorder manufacturer also sold a reader device which would play the tapes back (at high speed) which connected in some way to a computer system for analysis. Which is exactly what MET needed. But it was extremely expensive. They thought "what's the difference between a tape recorder and a tape player?" The electronics! They figured they could modify one of the inexpensive recording units to instead play back the tapes. And they contracted this then grad student to design and build them the electronics for it (ostensibly for a lot less money than the commercially available reader). This was an interesting project. The tape recorder had a capstan to keep the record speed fixed at a slow rate; on their modified unit they had removed the capstan. This let the tape cartridge spin as fast as the drive motor could spin -- which was quite fast, and moreover, not at a fixed speed as the tape wound from one side of the cartridge to the other. 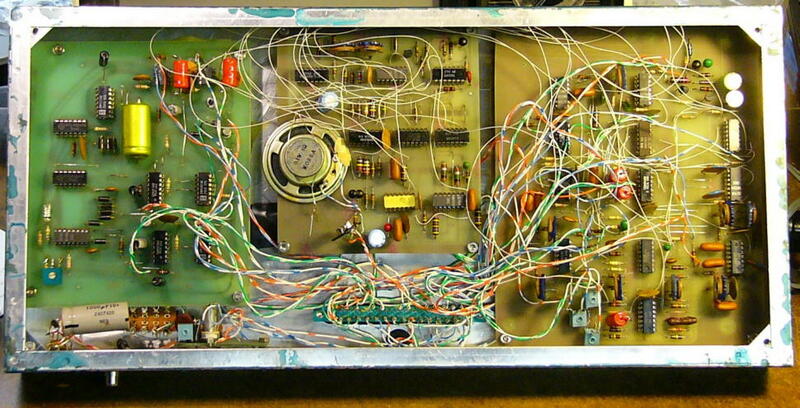 The record electronics was of course bypassed and my circuitry hooked directly to the tape track head coils. I didn't really know what the signal level coming off of the head would be, but a measurement showed that it was in the microvolt range. Seemed kind of low (maybe in retrospect), but I designed the analog front end to amplify it a gazillion, used differential mode, and employed shielded wiring because that much amplification was sure to run into noise and pickup problems. It worked, but not as well as we'd prefer -- there were read errors after signal discrimination (NRZ decoding). One of their guys scratched his head and thought "Shouldn't the signal level be higher than we're seeing?" He looked a little more closely at the unit, and guess what he found? There was a permanent magnet hidden in front of the tape head to erase the tape! 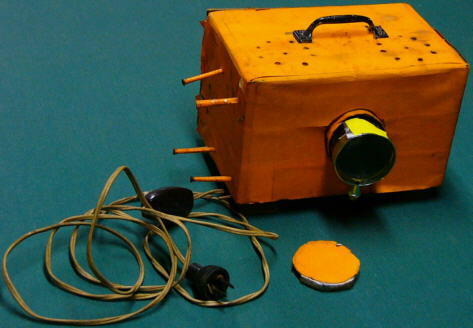 Made perfect sense, this box was sold as a recording device! But we were using it to play back the tapes, and every time we ran a cartridge through it, the tape was being erased more deeply (that might have been the big clue). I had so much signal gain in my circuitry that it was (partially successfully) reading the residual signal left behind after erasure. (Why couldn't the NSA use this same technique to read the erased 18.5 minutes of Nixon's Watergate tapes?) He removed the magnet and the signals were now in the millivolt range. I trivially reduced the gain in my front end, and presto, the tapes decoded perfectly reliably. This project was a little after my MAXI micro endeavor, and I used some of the same techniques: 44-pin edge connector Radio Shack prototype wiring boards and card cage. I even used an Intel 8224 clock generator chip to drive the UART -- I knew it was overkill, and the 8224 ran notoriously hot -- but it certainly could do the task without a care on my part, and as a bonus it included the power-on reset circuit I also needed. This was not a microprocessor-based project, it was pure hardware. 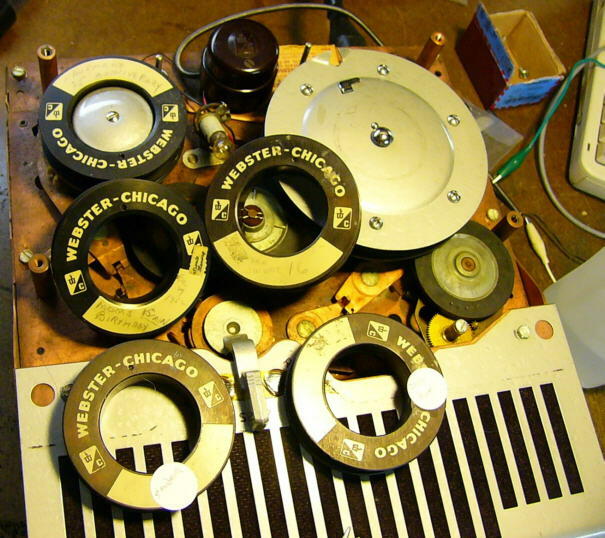 It had to pick up the signal and clock data off of the tape head, decode the NRZ pulses, and transfer the information to MET's PDP-11 minicomputer. 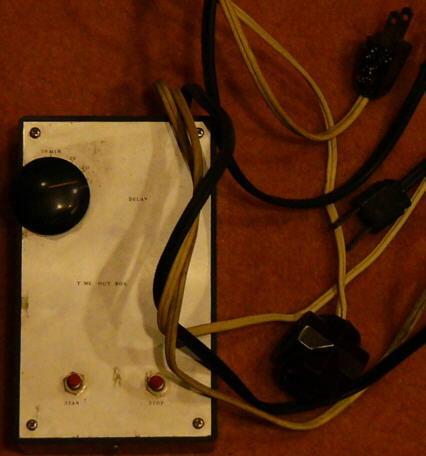 I used a standard current loop serial interface to the PDP-11, but knew that the computer and interface would not be fast enough to collect individual pulse info. So I designed in hardware counters which the computer could poll periodically to retrieve the information. My undergraduate PDP-11 experience came in handy for this project even though I didn't really have to directly deal with that end of the system. After the magnet episode, it worked great without any problems. Almost as an afterthought, they wanted to be able to use the same device to input paper chart power data as well. They had constructed a tablet type of gizmo that let them put a printed chart on it and have a clerk meticulously move a stylus to various points on the graph; it was attached to a potentiometer. So my box had a mode to read the pot voltage with an analog-to-digital converter (ADC) and transfer the data to the PDP-11 whenever the operator pushed a sample button. Sounds crude, but this was 1977 and it did everything MET wanted. Sometimes when you don't hear back from a customer after a while you wonder if equipment is even being used. But I ran into them a number of years later, and learned that they used my MET-1 interface for quite some time. Nice to know! Here is my project report. 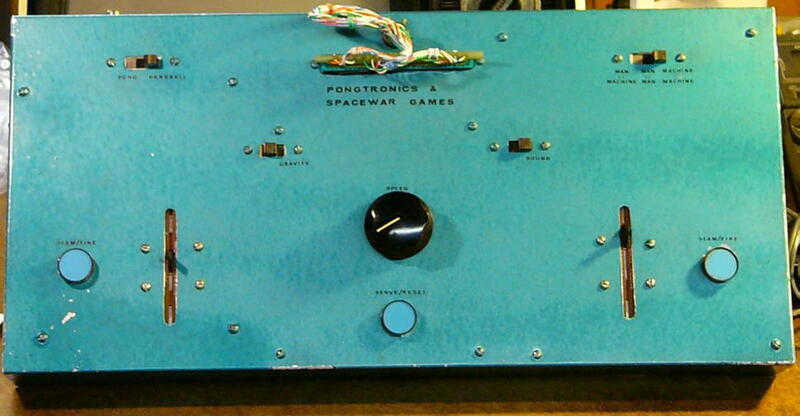 I combined two separate games -- Pong and Spacewar -- into one box. 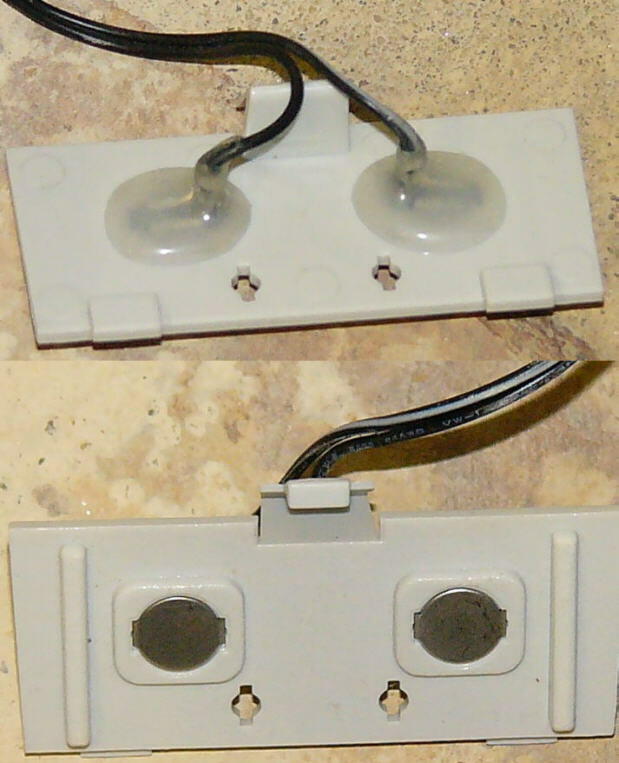 The edge card connector was double-sided; you plugged the cable in one way or the other to select which game. These CMOS circuits were in the magazines. I added a channel 3 modulator so you didn't need a video input (which wasn't common in the 1970's) on the TV. I was very impressed with these games, you could even play the machine! Until shortly thereafter when single-chip solutions came out, which put these games to shame (:<). Frequency Counter/Digital Voltmeter from around 1976? I bought the circuit intact from one of the hobbyist parts suppliers in the 1980's, it's just a transistorized flyback high voltage circuit. Powered from 12 VDC. I have a looseleaf binder filled with many other schematics I had designed. I just don't have the circuitry anymore, or can't quite remember what it was exactly for. Maybe that's why I take it out on my students now, forcing them to write better documentation! 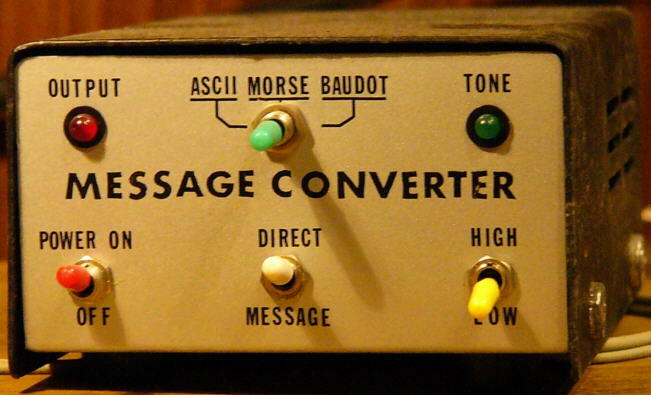 It used an 8748 microcontroller (actually an 8035/2716 combination, which was much cheaper at the time) and the DTMF chip to listen to tones on the phone line and convert them into ASCII, Baudot (typical TDD terminal then), or Morse code (LED illumination) formats. (To permit the deaf to use the phone.) Each letter used two depressions, the first the button with the desired letter, followed by 1, 2 or 3 to designate which letter. For example, 23 supplies "C" because the "2" button has "ABC" on it. That's my MAXI micro Term, TV monitor, and two telephones to demonstrate the system at the show exhibition in DC. It has 198 line powered LED's (draws 14 continuous watts). The colors don't show up too well in the photos -- the name is green, number yellow, and arrow red. It is visible even in daylight, and deliverymen appreciate it! Built onto two aluminum rack panels (front/back). The old-fashioned device has two RF oscillators, one fixed and the other nearly zero-beat to the first with the frequency trimmed by nearby body capacitance. 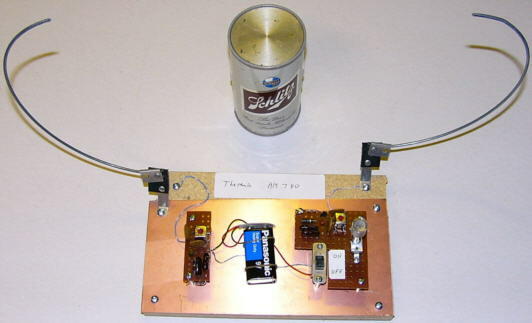 You wave your hands around it and the frequency difference comes out as a variable audio tone on an AM radio (my beer can radio above). 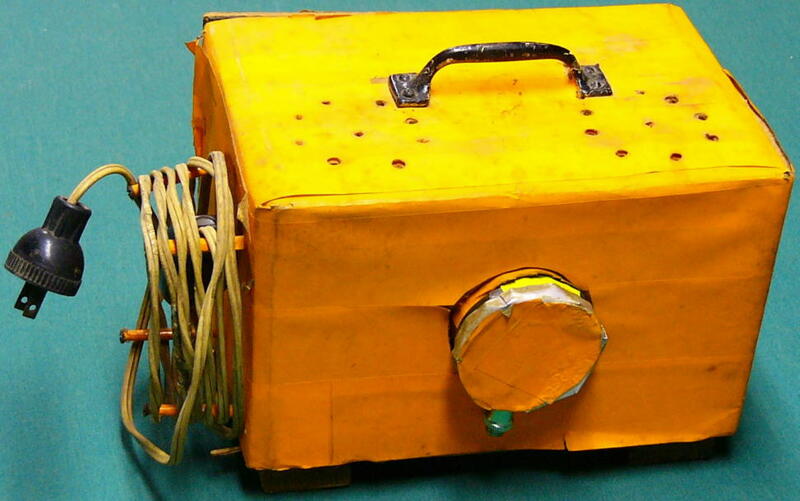 Very popular device to generate eerie sounds for old science fiction movies! The unit had been passed down to him, and since he was a kid he had wondered what the recordings that were on the spools of wire sounded like. 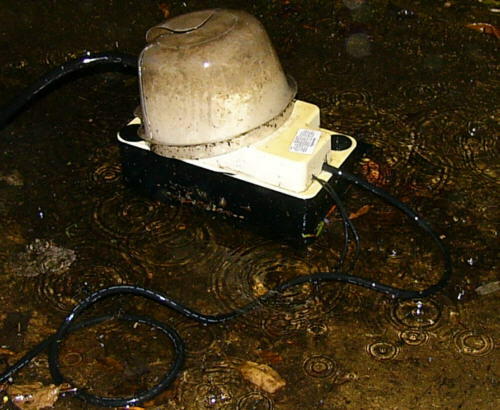 He had already had the AC power cord repaired, but nothing happened when it was turned on. I found the power fuse and it looked like it had disintegrated; so we replaced it and turned the power on. The tube filaments lit up -- after about 20-30 seconds, one of the plates was glowing red. Then the new fuse blew. 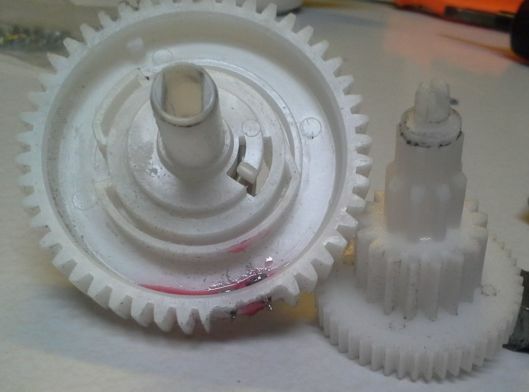 I knew that the most likely failure mode for this type of gear not turned on in probably 50 or 60 years was the electrolytic filter capacitor. So I actually had slowly ramped the line voltage up with a variac rather than directly powering from 120VAC. I'm guessing that replacing that cap will restore the box to operational order, but didn't bother with that. Our goal was simply to retrieve the audio recordings for Russ (at right). I pulled all of the tubes to prevent the (again replaced) fuse from blowing. The good news was that the motor (there is only one) worked. After some cleaning with alcohol and judicious lubrication I could make it go forward to play and reverse to rewind. It still took some finger action on the mechanism to get it going in either direction. 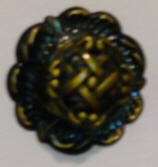 The rubber mountings had deteriorated and in some cases turned to dust. The wire broke a few times in the process of getting the mechanism to do its job. It's kind of interesting that there is a mechanical part which moves the head up and down as the wire winds onto either the supply or takeup spool. This evenly spreads the wire onto the spool much like a sewing machine, and prevents bunching. I also thought it interesting that there is no capstan -- which on reel-to-reel and cassette decks keeps the tape velocity constant as the diameter of the takeup reel increases throughout the play time. This design simply used a large diameter takeup spool, so even when it is filled from the supply spool its diameter isn't much greater than at the start. The motor speed and idle wheel reductions set the transport speed. With the tubes removed, we had no active electronics. But we didn't need no stinkin' tubes! I attached the leads from the head to the input of a (transistorized) audio amplifier (in between the two laptops in the picture below). We threaded the wire through the (playback in this mode) head and the takeup reel and got the wire moving. We could hear the audio from the past emanating from the amp's speaker! The rest would be a cakewalk. I tried feeding the head signal directly to the microphone input on the laptop, but there wasn't sufficient gain. So I connected the head to the input of the transistor amplifier and the amp's output speaker jack to the laptop's line-in jack. With Audacity I could record the session and edit it afterwards. There were sections of the wire ("tape") that had great audio levels and others that were much lower. Some were simply people talking too far away from the microphone, but on other sections I think that someone pushed the record button over top of the previous recording and mostly erased the former data. I selectively edited portions and amplified them (a lot) to try to bring the sound up to a listenable level. Of course that boosts the noise level quite high. Another problem is that I live too close to WCAO-AM (they moved their transmission towers to the neighborhood after I moved in!). So in the sections of the recordings where I amplified it a lot there is a residual background of the local radio station. Oh, well. It was a fun little project which reminded me of the vacuum tube days and the more formal manner people behaved in radio-like interviews in the 1950's. I had noticed some detritus in the trunk of my 1995 Infiniti. 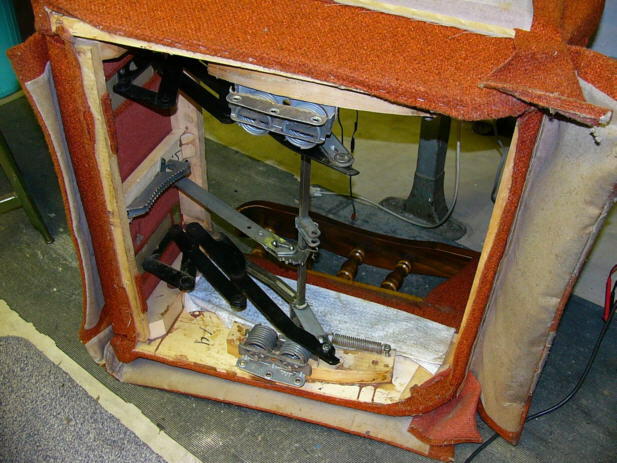 Further inspection revealed that the rear speakers had deteriorated -- the cones were now isolated from the frame, suspended solely by the voicecoils. Recalling how easy it was to replace speakers in 1970's era cars, I looked to swap them out. But I couldn't figure out how to remove them! They were clearly bolted in from above but there were no screws on top to remove the grills in order to access the speaker mounting screws. I concluded that it would be necessary to actually remove the rear deck below the back window. This seemed drastically crazy, but a web search provided instructions (which didn't turn out to be precisely correct) indicating that I wasn't crazy, that deck indeed had to be removed. Didn't want to leave the car disassembled too long, so I bought replacement speakers before removing the originals and attacking the job. These are two-ohm units, and most of the ones available are four-ohms. Ironically, I found and purchased a pair of Infinity speakers for my Infiniti car. 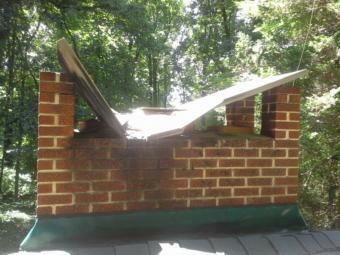 It was a bit of a job removing the top deck, but it all worked out. Got this done in March 2012 and now the bass response has returned. I guess these speakers will last the remaining lifetime of the car. With the speaker problem fixed, I wanted to address an issue that had been gnawing at me for a while: playing MP3's in the car. 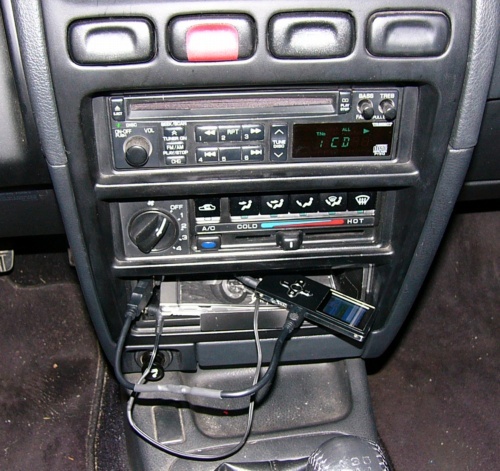 At first I had tried a Belkin FM transmitter to let an MP3 player broadcast to the car radio. It appeared to have a very low output power, because no matter what frequency I selected it seemed to heterodyne with broadcast stations as I traveled. It was too aggravating. Plus I was using the cigarette lighter socket to power it and it was more cumbersome than I'd prefer to hookup and disconnect. 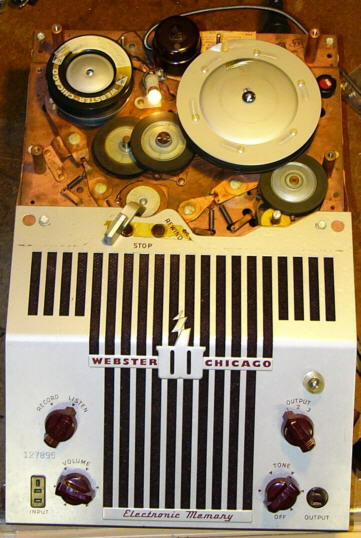 I had settled on using a standalone audio amplifier (abandoning the car radio altogether) -- the same one shown above in the Wire Recorder episode. Powered also through the cigarette lighter socket, it worked okay. But it still was a cumbersome connection and of course the sound was not nearly as loud as the car radio would be. I was determined to establish a direct connection between the MP3 player and the radio's internal audio amplifier. After figuring out how to remove the surrounding dashboard cover (that houses the four accessory switches at the top of the photo) it wasn't too hard to remove the radio itself. I took the top and bottom coverplates off of the radio. Still thinking with a 70's attitude, for some reason I expected to see a stereo volume control potentiometer which would have been trivial to interrupt to divert the audio input to an external jack. But of course I knew that this radio was all digital -- the volume control is an optical encoder that drives a microcontroller. As an integrated unit I wasn't sure how I could find a place to cut the audio path. I was stymied trying to remove the circuit boards anyway: I didn't readily see how to release them (without a service book); I was afraid that I would pry something that wasn't intended to be pried and break a perfectly good radio. There were two unused connectors on the rear of the radio. I recalled that this model had an option for a separate CD changer unit that mounts below the heating/cooling control section. There is a button on the radio to select this sound source (which did nothing at all without the changer installed). I became obsessed with using this audio path for an external MP3 player. Clearly this is the preferred method: all I should have to do is convince the radio that an external jack is a CD changer. I could connect a stereo audio input jack to the radio connectors and be done! I failed to get any specifications on the radio interface, even with the exact model number, so I attempted to reverse engineer it. How hard could that be? The radio connected to the car wiring through two plugs which were more complicated than the older simpler ones I was familiar with (power, ground, left/right speakers). I figured it would be easier to work with it in the car instead of running it on the workbench. So I made up a cable to connect to a DIN and some other type of jack on the radio, re-installed the radio and probed the signal lines with my VOM (actually DVM). There has to be a way that the external changer tells the radio that it's there. I guessed that it might ground one of those pins, so I carefully grounded each (through a resistor in case I was wrong). Pushing the radio button each time still did nothing. So I guessed that maybe a pin needed +12v instead of a ground for that purpose. Still nothing. Then thought that maybe the micro sampled those sigs on powerup; so I tried the ground and +12 on each pin (13 of them) powering down/up. Still nothing. I dragged an oscilloscope to the garage and looked at each pin while activating the radio button, looking for a pulse or something. Nada. I put a signal generator onto each pin (through an isolating cap) and found that I could drive the left and right audio paths (superimposed on the radio or CD playing). But the MP3 player's audio output on those same pins accomplished nothing -- the sig gen must have been overpowering internal circuitry. Anyway I still had the other audio source running. It killed me, but after spending a couple of days on this I had to admit defeat. I know this is the way to go, but without the radio or changer specs I could not make use of this method!!! Back to Plan A (interrupt the audio path inside the radio somewhere and attach an external jack). Pulled the radio out and removed the covers. After about a half an hour or so I managed to remove an auxiliary board which houses the balance, fader, bass, and treble controls. The audio path has to go through here, right? Failed to identify any discernable signals. After about another half an hour or so I manage to remove the main circuit board. I was a bit terrified with this: there are a couple of flat cable connectors, I was flying blind, and feared I would break something or not be able to re-assemble properly. This radio has a built-in CD player (one disc as opposed to the 6-disc external changer) and I thought that there would be a separate CD player circuit board which had to attach to the main board. There just had to be a stereo audio path between the two! My guess was correct: there was a flat cable between the two boards with about 15 or 16 lines. 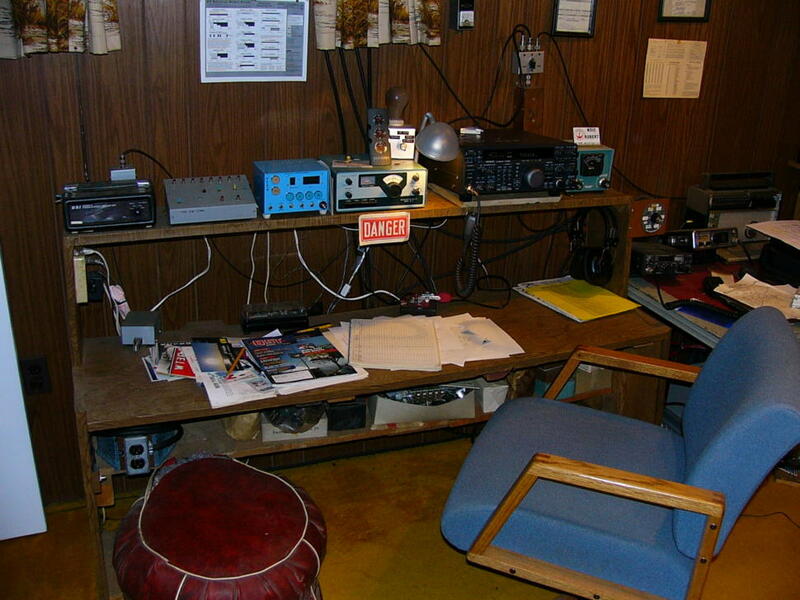 By this time I had gotten the radio operating on the workbench. My plan was to interrupt the CD audio path, so I would have to play a CD while listening to MP3's. I put the boards back into the radio and good news, it still functioned. But now I had to find the left and right audio pins on the interconnecting flat cable. To get to the board pins the radio had to be upside down while playing a CD: it made a scraping sound but mostly managed to play with the anti-gravity positioning. Tadah! Found the two audio paths. Next job is to interrupt them. Removed the board again. It is a combined surface mount/through hole configuration. 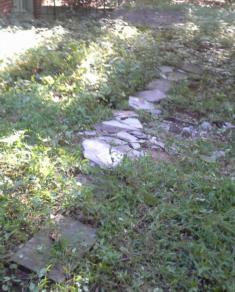 After some work I identified two traces I could cut to accomplish the task. With a 4-conductor + ground shield cable I routed the two audio paths through the cable to a standard stereo miniature jack with internal normally closed contacts. Routing the CD-audio through the cable/jack was not as ideal as the failed Plan B (CD changer one-way audio input) but should work fine. Reassemble everything, try with MP3 player, and it all works great! Lucky for me the audio levels were compatible as is. It would be nice if the MP3 player's internal battery charge level were not an issue in the car. On a roll, I wanted to put a charging jack near the car radio. So I put in a 5 volt linear regulator and attached its output to a standard USB socket. I mounted it directly above the cigarette lighter but for the life of me I couldn't get to its wiring to power the regulator! Just bridged a wire onto the +12v pin on the radio connector to feed it. I could now use a standard USB cable to the MP3 player to charge it. (Two days later in the dollar store I saw a dual USB converter that plugs into the cigarette lighter socket that accomplishes the same thing -- but it is bulky and awkward compared to the jack I installed.) As a finishing touch, I made up a 6" USB cable and a 12" audio patch cable to avoid a bunch of unnecessary cabling in the cramped space. The final configuration is in the photo above. The external audio input jack and USB charging socket are just above the cigarette lighter. To play a CD I just have to unplug the audio cable from the external input jack. While I had the dashboard open I added a small piece of angle stock (painted black) to the bottom of the tray where I usually put the empty CD case for the loaded disc -- occasionally it would fall out when accelerating (nice after 17 years). One MP3 player I have will charge while it plays if the two USB data lines are shorted to ground; another one won't charge unless the data lines are open! (it still doesn't display that it is charging, but it is). So I added a 4-pin DIP socket adjacent to the USB jack: top=+5v, middle two=data lines, bottom=gnd; a header plugs in that shorts the bottom three for the first player. Header removed for the second player. This way I can configure the data lines individually open, gnd, or power to accommodate any future devices. 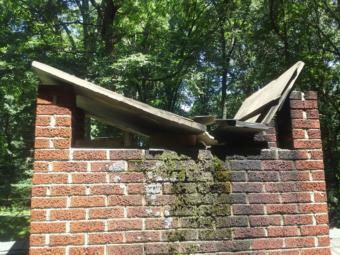 I first had to reglue two pieces of dislodged bricks. 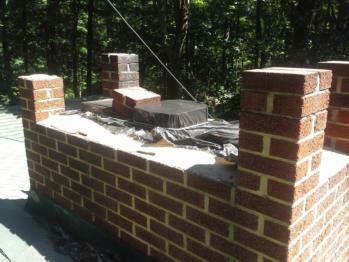 At first I was going to drill and put masonry screws into the brick, but I haven't had good luck with that in the past. 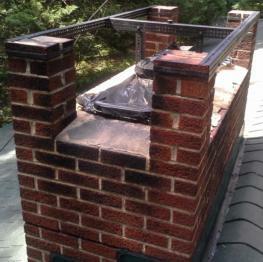 So I wimped out and devised a metal strap method that tightened around each brick post and the center chimney stack. 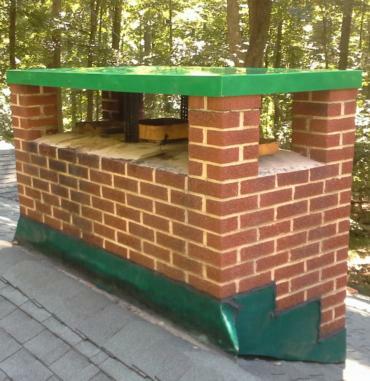 The angle stock was quite strong -- placing center support down to the chimney base was probably unnecessary. 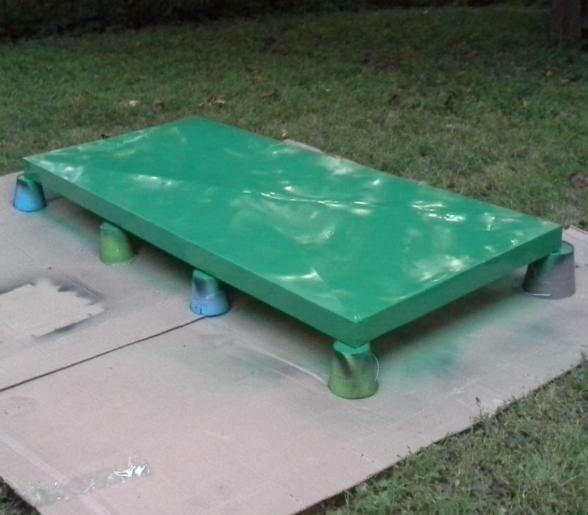 After cutting and before attaching, I painted all of the hardware flat black before assembly on the roof. A lifetime of music collection is stored on CD's, cassette tapes, vinyl LP's, and 45's (at least I don't have any 78's or 8-tracks!). My new car doesn't have a CD player (and of course not a cassette deck), so that prompted this project. First, there are so many things counter to this project that I am sure the modern reader will say "Why Bother?" doing all of this. For one thing, the car has internet radio in addition to broadcast radio, so there really is no need to supply one's own media. More significantly, the concept of owning music is so old-fashioned. Why not just subscribe to Pandora, Spotify, or any of the countless music streaming services? 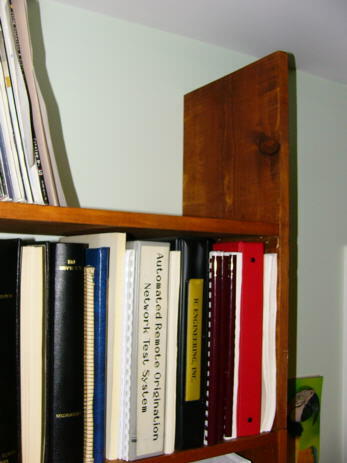 Nothing wrong with that, but I just think it is neat to be able to also have one's own personal actual physical archive. I realized that conversion would take quite a while to complete, but still the thought of it all was intriguing. So in the Summer of 2015 I embarked on this music digitization project (and had it completed in September). The easy part first: CD's. I used FreeRip to rip the tracks off all the CD's. 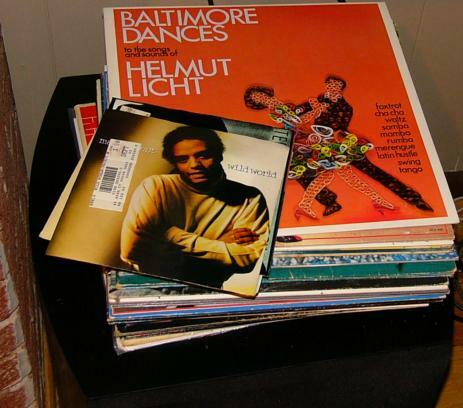 This is mostly painless, as the program uses an online CD database to populate the album name, artist, track titles, and various tags automatically. Some editing is necessary, especially for compilation albums which have various contributing artists. I've also found that the database must have used human entry at some point because sometimes there are spelling errors or typos. But it takes about five minutes to process a disc, so I stayed at the computer while going through mail or reading the newspaper so I could begin and end the ripping process for each, and inserting and removing them. I decided to store everything in 192 kbps fixed MP3 format -- I think that this is high enough quality so that I will never observe anything different from a standard CD, and is ubiquitous enough so that any device should be able to play it. Next, the cassettes. There was no way around the fact that realtime analog playback and recording was required. I still have the cassette deck that they were all recorded on originally, it is a part of my sound system. I also had years ago run shielded audio cable between the living room housing the audio gear and the office with the desktop computer. (Mostly used to record off-the-air shows long ago.) I had isolated each channel with 600 ohm: 600 ohm transformers to minimize extraneous hum pickup, and that worked pretty well. So I began the laborious process of the analog recordings. I used Audacity along with the computer's sound card input. I temporarily stored each 45-minute piece (I mostly had recorded an album on each side of a C-90 tape) as a raw file in CD quality (44,100 samples/second, 16-bit stereo) form. Most of them were recorded as I watched Orioles games, starting/stopping and flipping the tapes every 45 minutes. 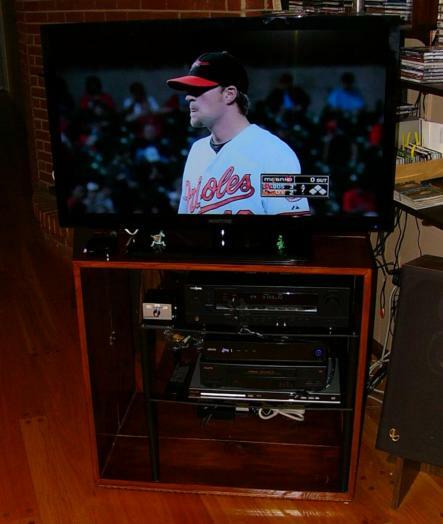 Usually I use the stereo system to listen to the television audio, but I sacrificed the sound quality of the play-by-play announcers (sorry Jim Palmer and Mike Bordick!) and just used the TV's internal speakers for the games so that I could use the stereo for the playback process. The day after recording several tapes I processed them. This was more time consuming than for the CD's. I used Audacity to isolate the tracks and save each one in raw CD format. Then I used FreeRip to do the mp3 conversion as with the CD's. However, this time I didn't have the automatic data population capability. I manually searched FreeDB for the particular album, then copied/pasted the album, artist, and track names along with album year and genre. I had to manually type in the track numbers individually. Having the track times listed in FreeDB made it easier to isolate the tracks from one another when cutting them out in Audacity as well. 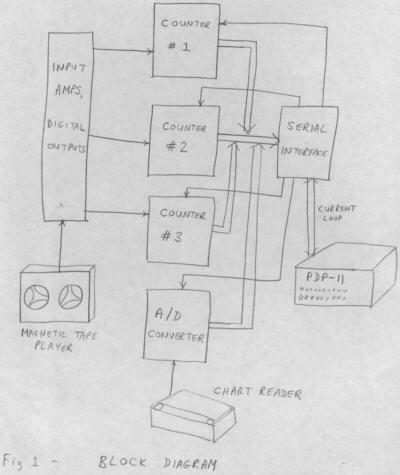 This process ended up taking about fifteen minutes for each album (half of a C-90 tape). Lastly, on to the records. I don't have that many of these ancient recording repositories. Same process as the cassettes, except that I had to flip them every 20-25 minutes. First I had to repair my turntable (not for the first time, either). It is a linear tracking Sony, and the drive belt between a reversible DC motor and the arm movement deteriorates every so often. Couldn't find any suitable replacements this time around, but with judicious searching found a rubber band that works well enough. The neat thing about the linear tracking method is that precision is not required for this piece, it gets the arm into the vicinity with activation and feedback to move it along the width of the record. Rubber bands don't last as long as proper rubber belts, but they don't cost anything and when will I use the turntable again after this project? The farther I got along in the analog recording part of the process, the better I got with the processing. I did not want to spend too much time on each piece or it would take forever and possibly cause me to abandon the whole project. But there were a few things I fixed along the way. My cassette deck had had an intermittent problem from way back: occasionally when recording it would interject some oscillations on one track. I know exactly why: a relay that switches the head coil between record and playback modes sometimes would not make a good closure, open-circuiting it leading to instability. I was going to replace the relay way back when but deemed it too much work to get at it for its rare occurrence. I had found that it only reared its ugly head when the deck was cold, so I had developed the practice of putting the deck into record mode for a while before actually making the recordings -- that mostly alleviated the problem. Still, some bad recordings resulted. Generally that amounted to a few bursts of less than a second for the first few minutes of an album on tape. But now that the music was digitized, an easy fix! When I noticed it (I did not actually listen to the tracks while going through them) mostly by seeing the waveform in Audacity I simply copied the audio from the good track over top of the bad track. So an outlandish buzz got replaced with a monaural section -- pretty much unnoticeable. I also became more particular over the levels as I went along. If the right and left tracks were within a dB or so when visually inspecting the waveforms, I left them alone. If they appeared too different, I somewhat equalized the volume levels between the two tracks in Audacity. I realize that this is a tradeoff between technical recording deficiencies and intentional artistic choices -- but I am pretty sure that I wasn't overriding the musician's intention. I found that the problem of vastly different channel volumes was most evident in prerecorded cassette tapes. I vaguely remember from decades ago that it was well known that these were of poor quality, which was ridiculous! Deciding how to manipulate the volume was also more of an art than a science. With analog recordings there are always some instances of quick clicks, etc. that exceed the volume of the actual music. Audacity provides a built-in amplitude adjuster such that it avoids limiting, but I used my judgement to sometimes let it clip when the clipping seemed to be only for artifacts and not the music's true dynamic range. I also made use of Audacity's built-in click and pop removal tool for the recordings from records I had on cassette, and of course the records themselves. I didn't bother with experimenting with the parameters; I figured I could probably find some settings that would remove more of them but sacrifice the actual sound quality in the process. So I just accepted the default values, assuming that they were already configured to do a decent removal without deteriorating the data noticeably. The tool minimized them, though certainly not removing them. On the poorer recordings, it was actually not that easy to discern the boundaries between tracks when the record noise masked the silent interval; after the removal tool it was a lot easier to segment the raw data. At the beginning of this project I had made the decision not to triage between music that I liked and did not. I figured that if I inserted opinion into the process it probably would make it take much longer, and then there is always the possibility that I would later regret it. It was simpler and faster to just digitize whatever I had. As a result, in addition to having music I do not care for at all, I certainly have some selections two or three times (from an original album and again in a best-of compilation, for example). 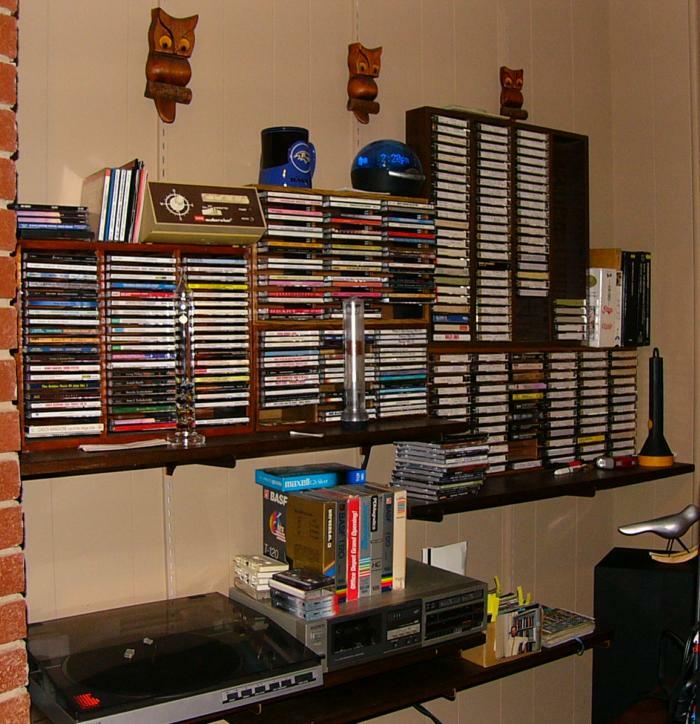 As best as I can tabulate, I digitized 176 CD's, 151 cassettes (mostly two albums each), and 33 records. 29.8 GB in total. My initial estimate was that it would fit on a 32 GB flash drive, but it wouldn't quite fit (when is a GB not a GB -- when it is counted differently because 2^10 <> 10^3, etc.). So I had to go buy a 64 GB flash drive after starting with 32. 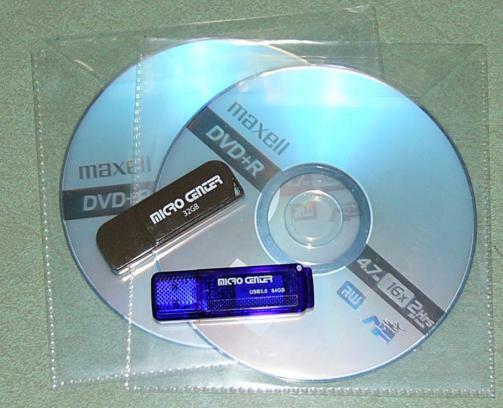 I had expected to put them on DVD's as well (and still might for safekeeping), to enable playback with my DVD player. I had also contemplated putting a laptop in the entertainment center for playback purposes (and still might do that, too). But then I discovered / remembered? that my television (whose audio output is an input to the stereo receiver) has a built-in USB input that can be used to play MP3's! So that is simpler. I can use the TV and its remote control to navigate through my entire music collection and play what I feel like. Of course I also put a flash drive in the car for playback. After the project's conclusion I bought new tower speakers and a sub-woofer to replace my 32-year old Infinity speakers. MediaMonkey reports that my digital collection consists of: 5121 tracks; 753 artists; 878 albums; and a total of 15 days, 9 hours, 56 minutes, and 50 seconds of music. A more normal person would not have gone through this work and instead have re-purchased mp3's for the collection (if not just used a subscription plan and avoiding owning any music at all). And my collection is surely not perfect technically. Maybe I am the only one who would generate a smile while I listen to a digital recording in my most modern technological automobile when I hear a scratched record sound emanating from the speakers. But we all need a sense of humor, right? 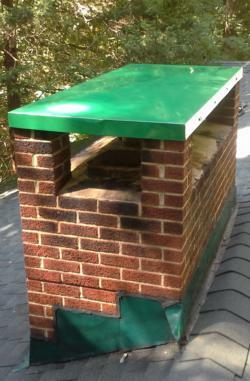 In December 2013 I had my 1967 oil burner furnace replaced after maintaining it for decades. I had had to fashion replacement parts for it as its manufacturer Iron Fireman no longer existed, nor alternative parts. I might have been the last person on Earth who understood how it mostly worked. It pained me to get rid of it, but I had had enough of constantly working on it to keep it going. The A/C was still working perfectly (although I had replaced the compressor's contactor numerous times and had also replaced its fan motor once). Uncharacteristically, with the new oil burner I opted to get a new A/C system along with it because it offered a hybrid heat plant -- if the outside temperature is warm enough, it uses the compressor as a heat pump and automatically switches to the furnace when it gets too cold for the heat pump to warm effectively. 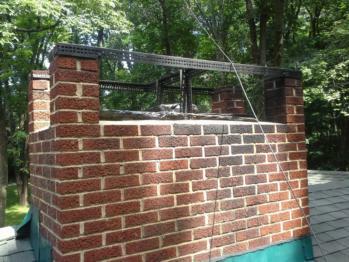 The new system works just fine, but the burner is no match for its predecessor Iron Fireman. The old one heated the house at 8 °F/hour and the new one at half that rate. 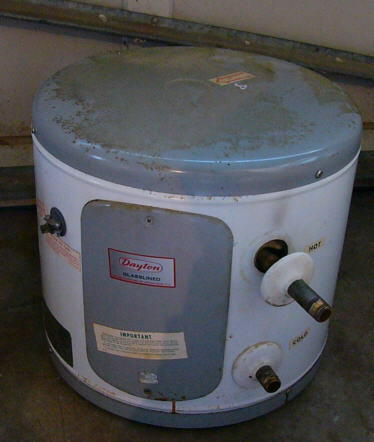 I guess in 1967 heating oil cost so little that they didn't care how big a burner to select! My imperfect measurements show that it costs at last winter's prices about 24 cents to raise the house temperature each °F using the heat pump, while it is 64 cents for the oil burner. I used maybe 60% of the fuel I previously used (with larger electricity bills, of course). I opted for the simpler Carrier thermostat, not the programmable one. I prefer to set it manually and not be bound to a weekly predetermined schedule. One nice thing about this thermostat is that it has three programmable buttons (labeled Home, Away, and Sleep) that can be preset to any desired temperatures. So it only takes a single button depression for control most of the time. In the past I actually just turned the heat off when I was out because the ancient furnace could heat the house up so quickly (and you get warm air from the vents in the process). I had to abandon that habit with the new burner because it takes twice as long to re-heat the home. As a result, I now had a more commanding reason for a remote controlled thermostat so I could start heating the house before returning. So in late October 2015 I worked on this project. The big name in this field of course is Nest, and I took a quick look at it. Their webpage is woefully lacking in actual operational details. There is no operating manual! I'm aware that its claim to fame is the fact that it learns your habits and adjusts the settings automatically. But I don't want automation willy-nilly changing my settings without me understanding its internal algorithm. I assume that I can turn the learning mode off, but not certain about that. I also want to be able to walk up to it in person and easily change the settings. Not sure if the Nest lets you do that (no useful information on the website). Additionally, it costs $200 and is run through a cloud server. I would prefer not to put all of my home/away information on someone else's server and be dependent upon their security/privacy policies. 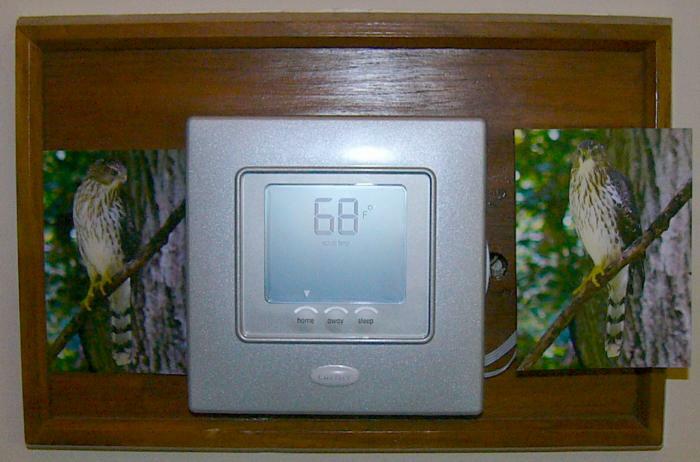 Next I looked at the Sensi� Wi-Fi Programmable Thermostat. It looked pretty good. It's about $125 and clearly lets you manually control it locally. It also uses their cloud server which I don't like, but that's not a deal breaker for me. The big question for me is how it handles the hybrid heat. My current Carrier system has an outside thermometer; I can configure the switchover temperature for using the heat pump or oil burner, which I've set to 40 °F. After that it works on its own (you can override it to use the furnace instead of the heat pump). 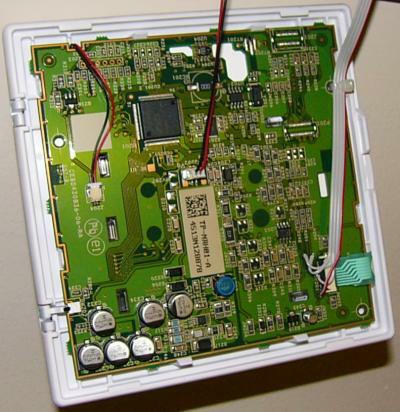 The Sensi (or nearly any other WiFi thermostat) does not accommodate an outside temperature sensor. I don't like that, but was willing to be reduced to actively selecting the heat pump or furnace manually (both locally and remotely). No actual operating manual on the website! What is wrong with manufacturers today? So I installed their phone app figuring it might be there, or at least I could see the real settings. But the app won't do anything until you create an account and presumably attach to a working unit. So I reluctantly called their tech support. After a while I talked to a fellow who seemed like he knew the real score. He confirmed that there was no handling of an outside sensor, but after multiple questions he told me that there was no user input that could select between the two heating methods. Instead, it handled it on its own. And its operating algorithm apparently is whenever heating is called upon: it (1) tries the heat pump for a while, maybe 20 minutes or so; (2) checks to see if the room is up to the set temperature; and if not, (3) switches to the oil burner. There are two things wrong with this mode of operation: (1) I want to be able to let it use the heat pump for hours, slowly raising the temperature by remote command -- which is why I want remote control in the first place. And (2) in the dead cold of winter when I don't even want it to attempt to use the heat pump, it will waste time trying it first. As an engineer, I find this so, so, stupid. Just let the user select automatic, heat pump, or furnace! Both locally and remotely. 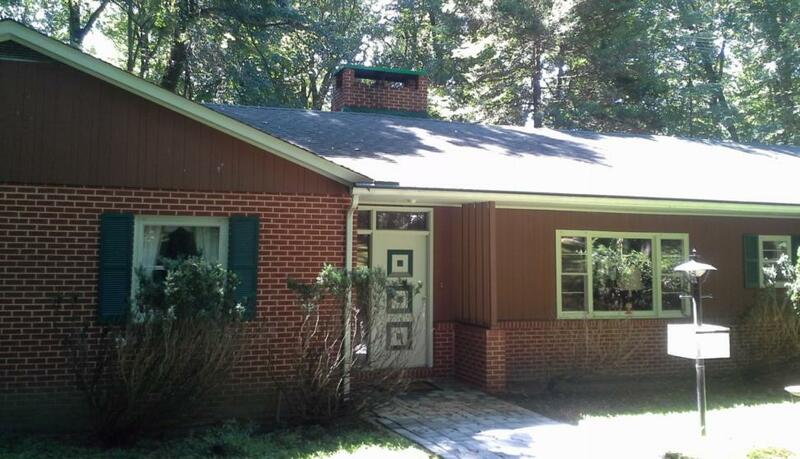 So sadly I had to eliminate consideration of this unit for my house. I admit that it would be nice to have a fully functional WiFi thermostat, but in fact I doubt that I would ever really need more than a few simple functions. Plus the Carrier system I have now is smart and works just fine. All I really need to do is to remotely be able to push the existing Home, Away, and Sleep presets. Plus it would be nice to be able to remotely read the inside temperature. So I decided to build my own. I ran across a nifty device: the Electric Imp. It is a microcontroller module that incorporates WiFi and is programmed in a high level language, similar to various Arduinos. And it costs $20! I carefully disassembled my Carrier thermostat and buzzed out the contacts for the three presets. This was not that easy to do because I couldn't really get to the buttons themselves, and separating the boards, etc. was somewhat risky -- I surely didn't want to damage the unit which probably would cost more to replace than all of these other alternatives. I successfully found the three pairs of contacts, which happened to have one lead in common, and brought out a four-wire cable paralleling them and terminated it in a Molex connector. After that it was certain to be easy to interface. I built the Electric Imp onto a perfboard that contained three opto isolators (OFM-1A's that I have lying around) that output to the preset buttons, plus a thermistor that connects to an analog input. The Imp has its own built-in voltage regulator. 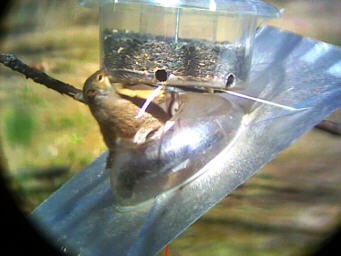 I tried feeding it from the 2-wire smart Carrier interface which sits at 17v, but it interfered with the communication. So I recovered two more wires from the original wiring and put a 12vdc power wart downstairs at the furnace to power it (0.9 watt). I mounted the perfboard to the wallplate with Velcro, and I fashioned a U-frame with sheet metal that covers the board and attaches to the wood with Velcro also. Took me a few days to properly comprehend the programming and system operation that Electric Imp offers. They provide a server that the Imp runs Agent code on; and the Imp runs its own Device code. A realtime O/S is provided. Simply put, you enter a command through a browser which contacts the Agent on their cloud server; the Agent code sends a message to the Device; the Device sends a reply back to the Agent; and the Agent sends a response back to the original browser request. Now I know that this is using a cloud server which I would prefer not to do, but it is a general purpose microcontroller interface whose function is unknown; so the security aspects don't worry me. Still, I don't like being dependent on an external service. Maybe I will investigate bypassing their system and talking directly to the WiFi hardware, but that surely will be much more difficult. My code takes a command for Home, Away, and Sleep and pulses the corresponding opto isolator for a quarter second to mimic a finger depression. It stores the most recent date/time of activation. Any command automatically sends back the Imp's status, which can also be directly requested. The status report shows the last command and the current house temperature. It works quite well and I can even activate it without getting out of bed and walking to the hallway. After the actual thermostat interface was completed the Imp had two I/O pins left over. But I only had one more unused wire through the wall to it. I was going to analog encode two signals until thankfully I realized that I could common the Carrier circuitry ground and the Imp ground, giving me two connections. So in December 2015 I added an OFM-1A optocoupler to my existing burglar alarm output and another one to the basement water detector (that just like the interface to its sister -- very easy, just power the device through the LED input). My Basement Doorway Pump works okay, but I have to remember to keep it clean from detritus or it can get stopped up. So it is useful to have a remote way to know that the floor isn't wet. The hardest part of this update was running twisted pair from the water sensor over to the furnace, where it could meet up with the wiring to the thermostat. So the Alarm and Water Sensor outputs filled the last two I/O pins on the Imp. I did put bypass capacitors on those two inputs, but I was still somewhat concerned that spurious fields might induce some interference on those two long wire (antenna!) runs. I have the Imp sample each signal 100 times at a one millisecond rate; if ALL of the samples show active (low), it counts as an active signal; otherwise I discard it. Essentially a low pass filter. (I haven't tested to see if ham radio RFI interferes with it yet.) With that, it was easy to change the agent and device code to show the current status of those two alarms (seen above in the screenshot). But I would like to push an alert rather than relying on myself to continuously check its status. The Imp's RTOS makes writing this kind of code quite easy: it doesn't even need a polling loop. An input pin level change can trigger a handler function (ISR, anyone?). When an alarm input transition is detected, I see if it is now active and previously inactive; if so, it's ready to send out an alert message. Before I even had looked into it, one of my students told me about Twilio. Among the many capabilities it offers is texting. I created a free account with them. It turns out that Electric Imp has an API specifically for Twilio. So now if the burglar or water alarms go off, the Imp texts my cellphone with an appropriate message. I don't bother texting if it disappears, as by that point I can check the webpage. Besides, neither alarm is going to extinguish itself anyway. I also added a Text On/Off function to the thermostat webpage, mainly for testing purposes. The only downside of the free Twilio account is that I have to use it every month to keep its number alive. I already have a list of things to do once each month (like run the backup generator for a couple of minutes, wind the pendulum clock, etc. ); so triggering an alarm is now added to that list. It is a good idea to regularly test equipment anyway; otherwise there is no good reason to believe it will work when necessary. I am very pleased with the whole system. Here is the (simple enough) schematic. I don't have any particular reason to anticipate a need for security cameras, but I thought this would be an interesting project with the technology that has become commonplace. With text alerts coming from the above project presumably informing me that the burglar alarm has triggered, it would be nice to be able to check and see if (hopefully) it is a false alarm or not. I haven't had any spurious alarms in recent memory, but there have been occasional ones over the years. Never knew what to attribute them to, perhaps a line surge or lightning strike nearby. The alarm itself runs off of a floating battery, so I don't really think any surges come directly from the mains; more likely induced voltages at the sensors. Whatever the reason, it will alleviate anxiety if I can see what's going on should I receive an alarm message. The impetus for this project in December 2015 was that Walmart.com began selling prepaid Android (KitKat) smartphones for $9.82. I assume that Tracfone is subsidizing them, expecting to make money off of the purchase of minutes. But with WiFi, and just to use the device as a WiFi camera, I don't need no stinkin' minutes! And of course that $9.82 includes an AC USB charger. The short story is I bought five of the phones. Here is the long story (you can skip this rant paragraph). Walmart's website (they don't sell these phones in the store, only via the web) says nothing about quantity restrictions. However, the radio button selector for quantity offers only one option: 1. Okay, I'm no neophyte online buyer. So I order one, then place a second identical order. Again, no indication that they only allow one per customer. The second order goes through immediately, approved, and I receive an email saying all is well and good. One minute later I receive a second email for that order telling me that there is a problem with the banking information for the credit card used, and my order has been "canceled by Walmart." Now, if they had simply told me that I already had one and can't buy another, so be it. But why accept the order, charge my card, then subsequently put the money back and tell me there is a credit card problem? I actually believed them and thought that my bank had refused the second order because it was for the identical charge within minutes and they perhaps thought it was a duplicate entry. So I tried a different card number from the same bank. Same acceptance followed a minute later with cancellation. Then I thought that maybe even though I used a different charge card, it was from the same bank tied to the same address and maybe the bank was that intelligent. So I tried a different card from a different bank (all with my identical address). Same pair of emails. I gave up until I picked up the one phone I had successfully ordered. Placed a new order, and it went through fine. I interpreted that to mean that Walmart didn't want more than one phone to be in process. When I tried to order another phone, same cancellation. So I figured I'd have to order each one individually and pick them up before buying the next. But this time around, it didn't work. So I tried a different shipping address (which is irrelevant because I was specifying the free in-store pickup). I did not expect that to work, because credit card transactions are verified by one of two methods: billing address comparison, or security code verification. I thought that Walmart would use the first method which would reject the incorrect address. But it went through! Only one email, not two. So I ended up creating multiple Walmart.com accounts with various useless addresses, even using the same credit card number. I am sure you are thinking that I am crazy for going through all of this, but I take it as a challenge and consider it a game, for entertainment purposes. Think what you will. For each phone I configured them with most everything turned off, and logged into my WiFi router assigning each a unique dedicated internal network IP address. 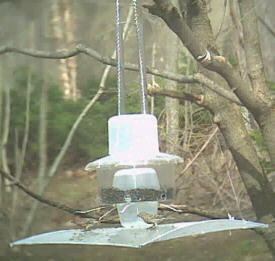 I installed the free IP Webcam app. Configured it to boot to the app, put in username and password protection, and set each for a unique incoming Port. With that, all I needed to access the cameras from my internal network was the individual internal IP and Port numbers. The webcam app offers a browser menu with various methods to see the live video. In order to access from outside the network, I configured the router to Port Forward each of the unique Ports to the corresponding camera internal network IP address. As long as I knew the house external IP address, I could sign in with that plus the particular port number to get to the desired camera. 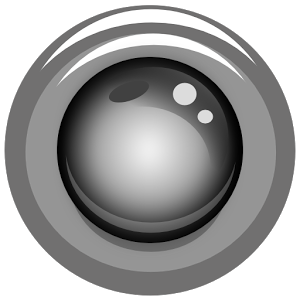 To make it easier, I built a private webpage (in PHP) that generates a link to each of the cameras. If the http request comes from within the network (I am home) it creates links using the internal network addresses. For external http requests, the trick is to know what the house IP address is. Theoretically, since I am not paying for dedicated IP, the IP assignment is dynamic and can vary. In practice, the actual IP assigned to me has not changed in over two years. Prior to that it had sometimes changed monthly or more. But I have already built the understructure to handle this! 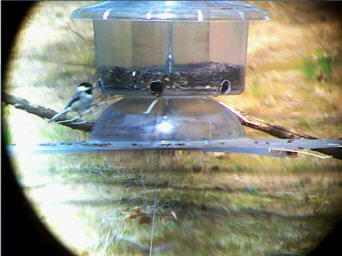 My Birdcam uses a video feed from the house computer and has the same issues. In the house PC's Start Menu is a link to a private webpage that simply records the originating IP address. 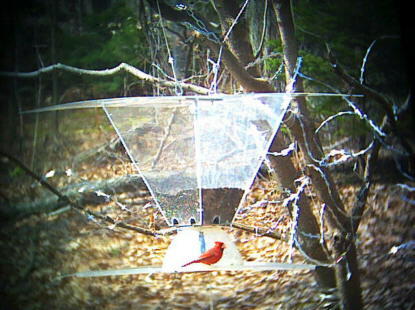 It stores it on my server, and the birdcam webpage generates the appropriate link address. So my Camera page generates the same external link using that information with no extra work. This method works because I generally boot my PC every morning which updates its IP address on the server. If that address changes during the day, it won't work again until I reboot or if I notice it all I have to do is re-access that special webpage. (If I wanted to I could just write a program to activate the identification page periodically, say hourly.) Now I'm sure you know that there are various cloud services which offer this same functionality. They must work in the same manner, having the remote device "call home" periodically so the cloud server can record the incoming IP. I don't know how often they send identifying packets. I prefer to do-it-myself instead of using a cloud server if I can figure out how. I had an Android tablet in which the charge circuitry had failed. I had cracked it open and looked for bad connections but was unsuccessful in repairing it. Since it practically could no longer be used for any other purpose, I re-opened it and soldered a wire pair across the battery terminals through a protection diode, and brought them out to a connector. I thought a constant-voltage charge circuit could work. First I added another diode drop and powered it from a 5.0 vdc power wart. After a day it discharged, so two diode drops was too much. I removed the external diode and tried it with just the internal diode drop. Works fine, so I configured the tablet the same as the phones and used it as a sixth camera. Still, I am slightly worried that the Lithium battery might explode from overcharging, so that camera is in the garage. Therefore I have six cameras that I can monitor at will. 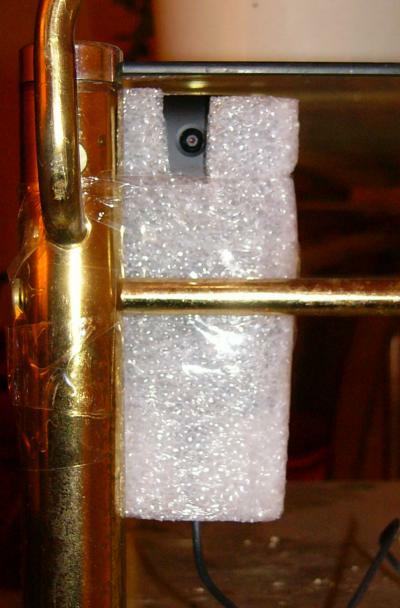 Not to get too creepy, the cameras basically monitor external door entrances. 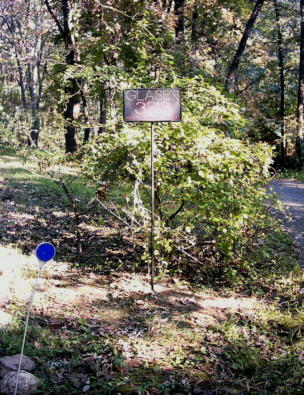 I mounted one on a tree a couple hundred feet from the house so I can see the road; I had installed a power outlet there when I had to repair a Romex break in the line that fed the house sign. I am thinking that I will be able to see if my road has been snowplowed or not with it. It remains to be seen if my packaging can weather the weather or vandals. That would be aggravating, but then again... it cost $9.82! 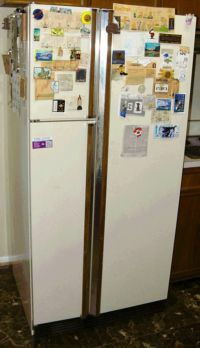 I bought this Norge 3-door refrigerator in 1983, and have been repairing it ever since. I liked the fact that it had a little separate freezer door just for ice cubes. This predated the now common icemaker/water dispenser mounted outside of the unit itself. My biggest problem with all of these appliances is that I only have to deal with each every few years -- so I don't remember the details or even the basics from the last incident. I try to take notes for myself but sometimes I don't even remember that a similar problem had previously occurred and don't look for any history. I'm sure that there were more incidents than listed here, especially prior to when I moved from a paper checkbook to Excel. August 1998: Appliance Repair of Baltimore replaced defroster heaters $240. This might have been the first repair that I just behaved like a normal consumer and called a repairman to handle. But I saw how he disassembled the insides to get to the defrost coils and that was fairly simple to replicate in the future. I believe that I bought replacement coils at least once or twice and did the swap myself. December 2002: D&D Appliance Repair replaced defroster heaters $159. Except apparently I had forgotten that I had replaced these coils myself and called a repairman again! June 2007: replaced condenser fan motor (Aireco) $23.83. This is the motor in the back that blows air across the cooling coils. Impossible to purchase a direct replacement, but I managed to adapt mounting to accommodate the new motor. July 2007: filed Temperature Controller's contacts. This is the unit that turns the compressor on when the temperature rises above the setpoint (28 °F) and turns it off when it drops down to another setpoint (13 °F). When I saw how much the replacement cost, I decided to see how long I could make it last just by filing and cleaning the contacts. See December 2014 for the answer! Some month 20xx: I have no record, but I know that I replaced the defrost timer at some point. Pretty easy. June 2013: replaced original compressor relay with solid state relay (Aireco) $5.98. The compressor motor has "Start" and "Run" terminals. The original design I think was quite smart: when too much current flowed through the Run circuit, it would activate a relay that powered the Start circuit. As the motor turned up to speed, the Run current automatically dropped which in turn released the relay's power to the Start circuit. The replacement is probably more reliable because it is not really a relay (even though the package identifies it as a "solid state relay"); all it really is is a PTC (positive temperature coefficient) fuse, which is in series with the Start circuit which is always connected. So the Start circuit is connected when the PTC is cold (low resistance) to get the motor running; then, apparently, once running the Start circuit draws an excessive amount of current which heats up the PTC thereby reducing the steady state current to a low level. With the original component, should the power flicker off while the compressor was running, it would power up perfectly properly because of the sense current trip. Now, if power is lost while the compressor is running -- meaning that the PTC is hot and high resistance -- when power resumes it won't supply the Start circuit with enough juice to get the motor turning. (If power is lost for several minutes, the PTC cools down and therefore the start-up cycle is normal.) What I haven't mentioned is that in addition to the startup relay or PTC is an overcurrent sensor on the Run circuit; when that trips, it interrupts current for a timeout period. But the timeout period is shorter than what the PTC requires to cool down, and in fact even though there is not sufficient current flowing through the PTC and the Start circuit to get the motor running, Ohm's Law keeps the PTC warm so it won't cool down enough to be ready for the next cooling cycle. While it is possible that if I let it spin its wheels on its own for a long enough period it would eventually restore operation, all I really have to do is unplug the refrigerator for 5-10 minutes which is plenty of time to let the PTC cool down and then plug it back in. But in the back of my mind is the question: what happens if there is a brief power flicker when I'm not home or don't notice it? I have never found the unit warming up on its own, so perhaps it works after all -- just not as elegantly as the original configuration. Note: it is amazing how well the human brain can do pattern recognition. When the Run overcurrent relay kicks out and in, and then the (original) Start relay activates for a few seconds, the sound sequence is quite definitive. If the motor is unable to reach operating speed quickly enough, it creates a clicking sound cycle of off/start/on which I noticed. That is how I even knew that something was wrong with the start circuit. The problem would not occur at once, but get gradually worse. I eventually learned that a repeated cycling indicates a problem, even for those times where it successfully got itself running normally. August 2014: defrost heaters (Air1Supply) $18.95. This is one of the times I remembered that I knew how to replace the defroster coils. Harder to obtain the exact replacement, but found similar enough ones. December 2014: Temperature Controller (Appliance Zone) $59.87. The contacts were too deteriorated for repair, so I bit the bullet and bought a replacement. February 2016: Water Inlet Valve for icemaker (Appliance Zone) $19.25. My icemaker was working, but I had fewer and smaller cubes than proper. These units use dead reckoning for the water volume, i.e. they activate a water solenoid which turns on the water inlet for a predetermined number of seconds. In this case, the existing solenoid was just acting sluggishly and was not opening fully to permit the proper flow which would fill the tray correctly. August 2017: replaced Icemaker (Appliance Zone) $63.25. 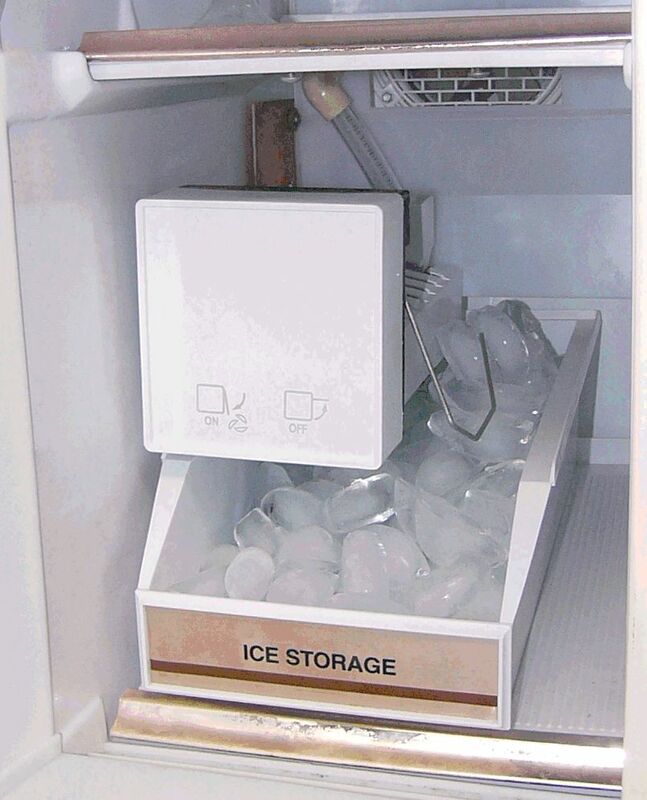 I don't see any record, but I know that I had repaired the icemaker mechanism at least once. This is harder to do than you might think, because there is a cold sensitive mechanical component that expands and contracts to prevent the icemaking cycle to operate unless it is indeed freezing. So once I pull the unit out of the refrigerator/freezer, of course it does not operate sufficiently for me to even figure out how it's supposed to work. 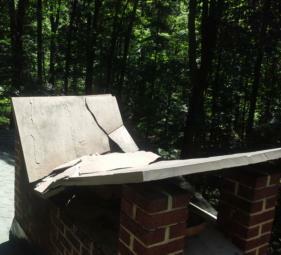 But I had figured enough of it out to make repairs. Until this time! 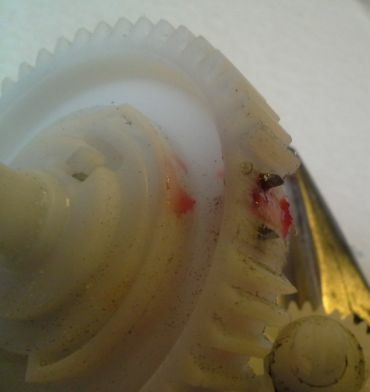 Disassembling the unit, I found the culprit: the main gear driven by the timer had three teeth ground away. Probably it had been operating blithely while first one, then two, teeth disappeared; but three (consecutive) broken teeth was just too much. Now I know that it is very difficult to repair gear teeth, but I gave it a shot: I drilled and tapped holes to take three #2-56 bolts which I screwed in and filed down. In fact this actually worked to drive the gears. But I subsequently found that the spot where the screw heads were was used by some type of cam sensor. I knew this was probably a death knell, but I filed the piece down which was getting stuck on the screw heads; then it turned properly, but of course whatever the cam was for would become inoperative. Now I fully admit that even after extensive examination, I really do not understand how this amazing mechanical contraption works. I did take a couple of photos before total disassembly, but to even get to the point where that is possible it is necessary to remove enough stuff which causes parts to pop out with various springs. So while I think that I made some very good educated guesses as to how to put everything back together, my confidence level on that is low. Also, remember that it will not even operate unless it is cold enough? So all I could do is try to put it together and re-install it and see if it works. Which it didn't. Which means I needed to come up with a new plan. It goes without saying that I was unable to locate an identical replacement icemaker. 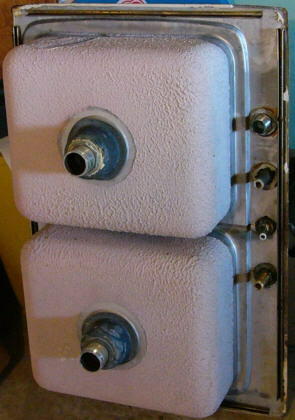 Which means could I find another icemaker that I could cajole into working in my 1983 Norge? At first this didn't seem that tough. But suppliers list pieces by the manufacturers' part numbers and assume that you are replacing one part with an identical one. And they show part numbers by refrigerator model number. But I could use neither of those identifying numbers, so I just scrolled through the pictures. They expect you will transfer small pieces from the old (broken) unit to the new one. Some units require another subassembly which isn't identified or noted. Eventually I did find an icemaker that was fully self-contained (except for the water inlet solenoid which is mounted in the back where the water comes in and I had just replaced anyway in February). Of course I knew that I would have to do some re-wiring and somehow get the water fill tube routed to the proper place. The wiring is pretty simple, with four contacts: case ground, 120vac hot/neutral, and solenoid power. The new unit which of course used a different connector kindly came with an adapter jumper for another refrigerator model (which also does not match the Norge) -- so it was a simple matter after buzzing out the new connections (actually I had to manually rotate the timer to get the solenoid output to trip in order to determine which of the power leads were hot and neutral); I cut off half of the adapter and replaced it with the old Molex connector. Now I had to mount the icemaker; the new model uses two mounting screws on the left side, but my old one mounted in the back of the compartment. 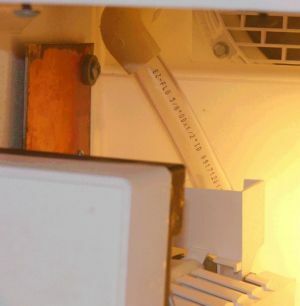 I thought about just drilling some self-tapping holes in the refrigerator interior, but instead just used some old PCB board stock to fashion a bracket to place a second mounting hole; I used one of the original spots for the new unit. I intentionally mounted it a bit lower than I think is intended because I don't like it when icemakers tend to overload the container bin and the ice cubes fall over the side. Lastly I needed to re-route the water fill. At first I just put a plastic tube over the existing tube (which originally fed a trough to the old icemaker but is at the left and doesn't match the new one) and let it just drop the water into the middle of the freeze chamber. At the time I didn't quite know the exact positioning and timing. Eventually I learned that on this device it fills when the ice is about 90% lifted out of the trough, and the tube poured water over the newly extracted cubes. Which worked but is obviously not a good idea. So over to the hardware store and get a right angle plastic elbow (31¢ and six inches of 1/2 inch plastic tubing (45¢, I had black opaque tubing but thought it would be neat to use transparent tubing instead to be able to see the water inrush). 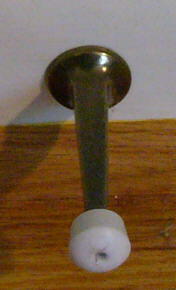 The tubing fits inside the elbow and a small section over the original fill tube mates with the top half of the elbow. Everything works great. Plus I learned how modern icemakers work. More intelligent than bending a plastic tray, it heats the bottom of the freeze chamber just prior to scooping the cubes out. Should this one break it will be a simple matter to get an identical replacement. I am pretty sure I know what you're thinking (beyond that I'm obviously crazy): "You fool, don't you know that if you discarded this anachronism and bought a modern refrigerator that it would save you money because those are much more power efficient?" My calculations show that the break-even point is ten years. Now, I ask you, how much confidence do you have that a new refrigerator will even work without repair for ten years? I know I'm being recalcitrant, but my attitude is that the best way to recycle equipment is simply to keep it operating. So I intend to repair this one as many times as it takes until either the compressor goes bad or there is a Freon leak (yes, it is old enough to probably contain actual ionosphere-destroying Freon).